The historic site of Hill End was a prolific gold mining town from 1872 to 1875. In the space of a few years, the gold deposits were exhausted and the place quickly faded into memory. 'Rediscovered' by Russell Drysdale and Donald Friend in the 1940s, their paintings made the area iconic in Australian art history. Heroic landscapes showing life and struggle in a harsh arid land set the tone for depictions of the Australian landscape for years to come. I stayed in Donald Friend and Donald Murrray's cottage for five weeks From December 2016 to January 2017. The following is an account of my work, reflections and observations during this period. 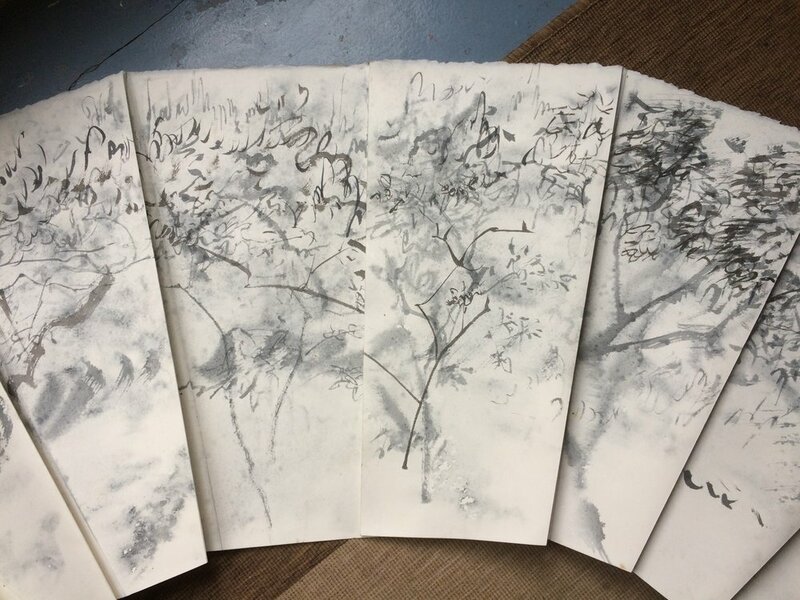 It was a vital time examining my agency as a Chinese, female artist responding to a land that barely had any traces left of its original custodians. Although I came to be very fond of the place and want very much to return, my initial response was a deep sadness and longing. I felt very keenly the absence of spirit in places such as Tambaroora, where people were still robbing the earth for their own material gain. The scent of honeysuckles greeted me upon my arrival on Tuesday 6 December. It was overcast, humid and warm. The cottage is cosy, the perfect size for an artist on their own. The gardens are carefully maintained and the interior is modest, but comfortable. Little critters such as spiders, lizards, ants, flies and moths make their way in and out through the gaps with ease. 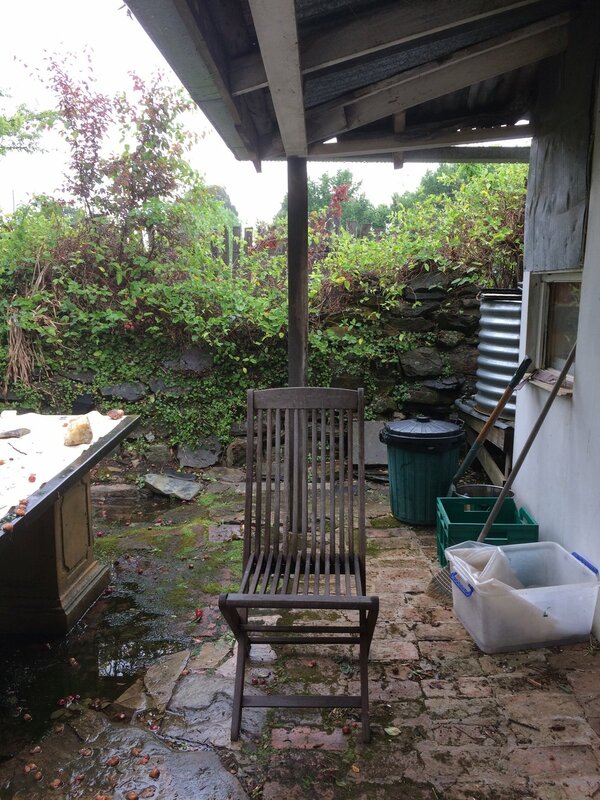 The thin plaster and stone membrane between indoors and out is punctured with many holes. Although solid beings have no trouble penetrating the walls, mobile and internet reception is non existent inside the cottage. For access to the wider world, I have to stand at the end of the backyard. This is proving to be the most challenging aspect of this place. Today involved a trip to Bathurst in the morning to purchase a few overlooked necessities and material for improvised curtains. The kitchen area was curtain-less and although not an issue by day, night time was slightly unsettling. There is a family of kangaroos who wander around the village of Hill End. One member stood at the far end of the backyard one evening examining the new occupant of Murray’s Cottage with interest for some time. The family also occupied the grass field next to the cottage for a day and night. They pop up into the front and back gardens when least expected. In the afternoon, I explored the village on foot but was too late to visit the museum and information centre. The sun remains hot and intense until 6:30 in the evening, but nights are chilly and the temperature drop is rapid. Prepared paper and found that the Blind walking scroll (now renamed the Table scroll) fits perfectly on the slate table in the backyard. 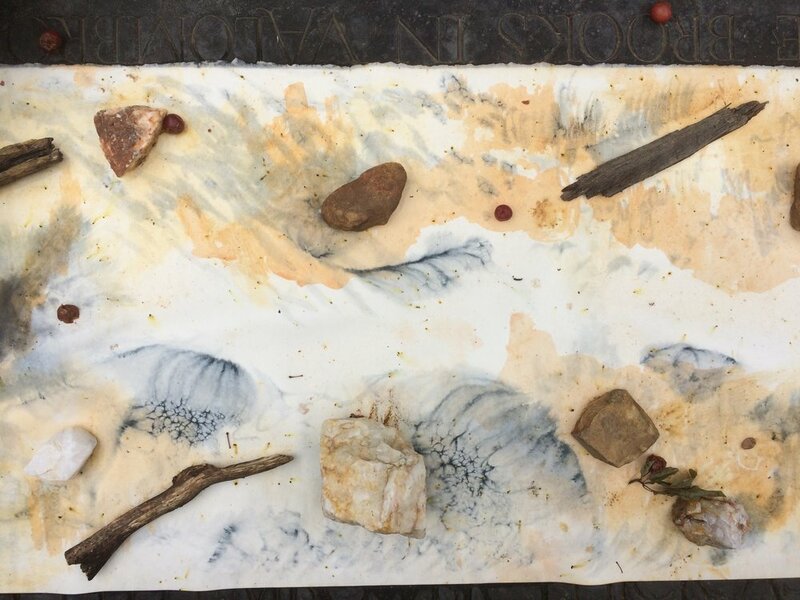 I decided to leave one on the table weighted down with stones and wood to let the elements, birds and plum tree leave their marks. That evening a great storm blew in and the paper survived the deluge with some beautiful results. 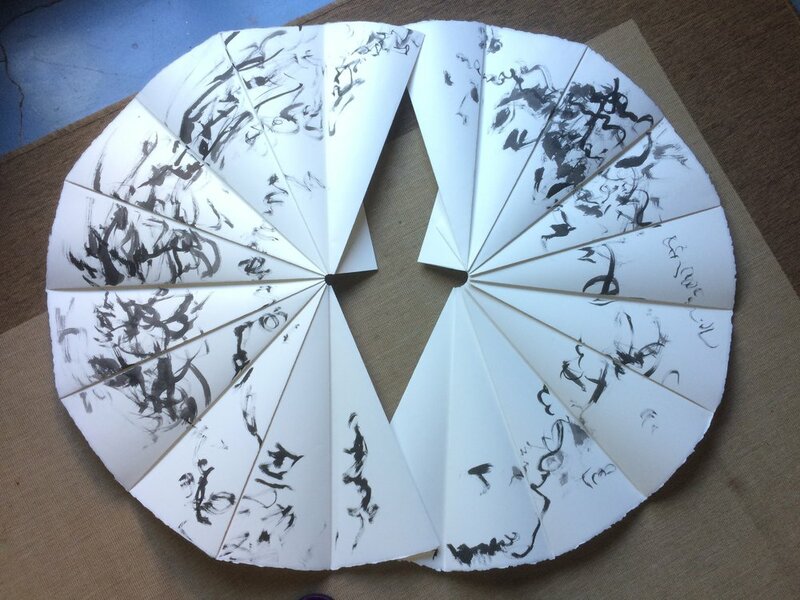 I spent the afternoon stitching the binaural drawings into shape. The light inside the cottage begins to dim around 5:30 and that is when I begin to feel homesick and lonely. The morning was very prolific. 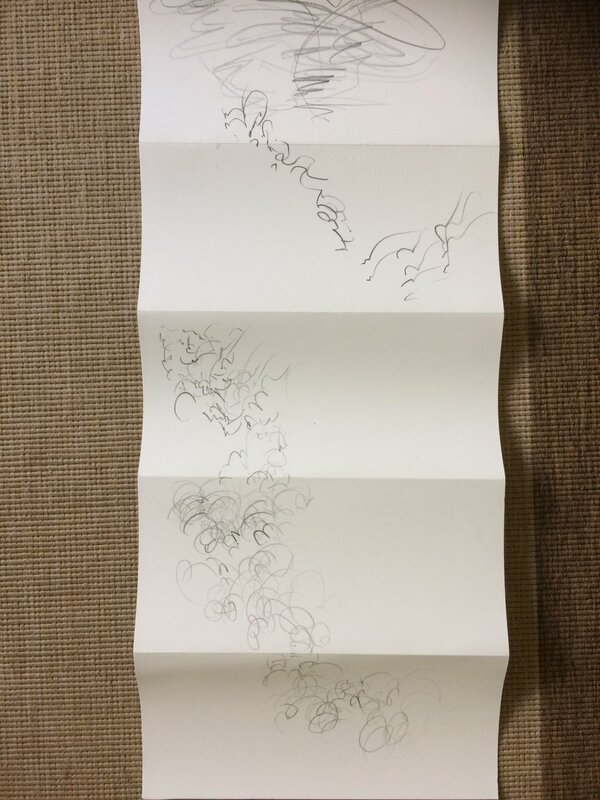 I began four drawings: Walking Scroll, Binaural, Pleated Arc and the Table Scroll. 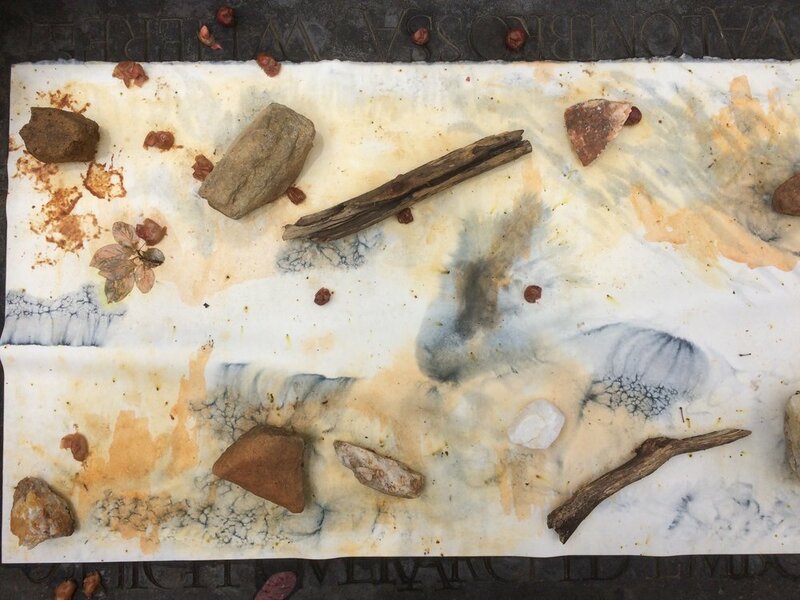 The Table Scroll was stained with pigment from wood blocks drenched by overnight rain, as well as splattered bird droppings and fallen plums. It was still very moist when I began drawing with ink pencils and sumi, and the resultant bleeding was beautiful. 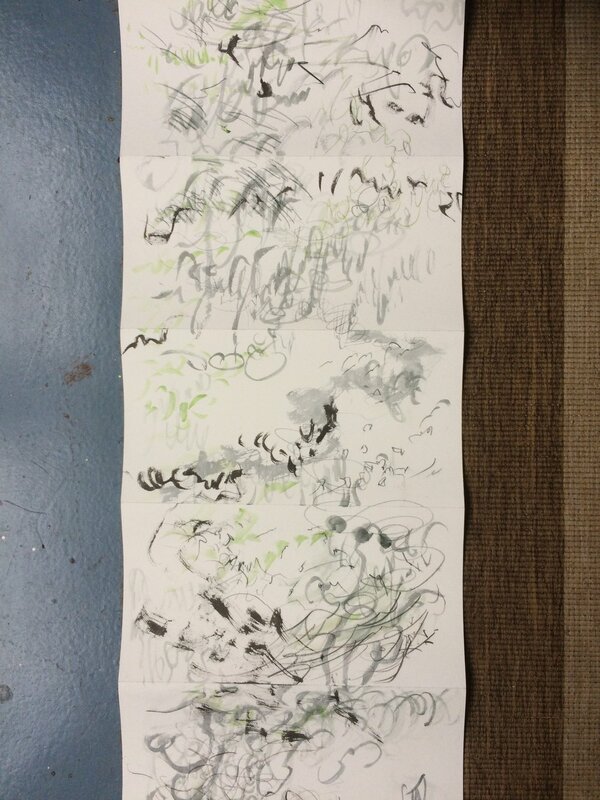 I also began the Pleated Arc and Binaural works with sumi. 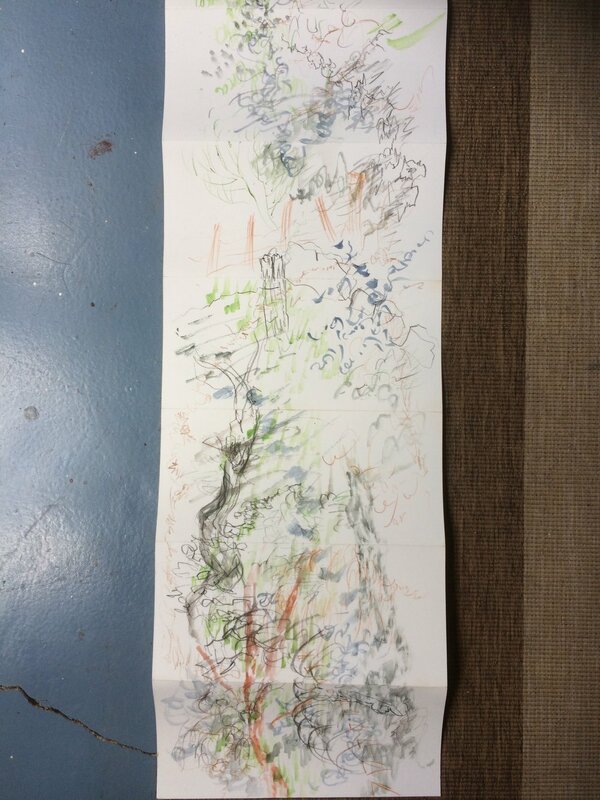 The energy of the marks was incomparably more expressive than pencil. I think I will thoroughly wet the paper in the next session and work on it again with ink pencils and sumi. While collecting the cottage keys from Bathurst Regional Art Gallery, I saw their excellent exhibition on Brett Whitely. I was most fascinated by his paintings from the 1970’s, when he began incorporating compositional elements from Chinese/Japanese landscape paintings into his work. His ink paintings were also very bold in their blatant appropriation of East Asian aesthetic. It made me consider how much the art market was and still is, shaped by dominant European tastes and values. It took a white male artist to bring ‘Asian style’ aesthetic from the realm of ‘otherness’ into an acceptable norm. The same can be said of Picasso, Jackson Pollock, French Impressionists etc. Such appropriation triggered new developments in painting styles and taste, and can be seen as a cultural byproduct of colonialism. 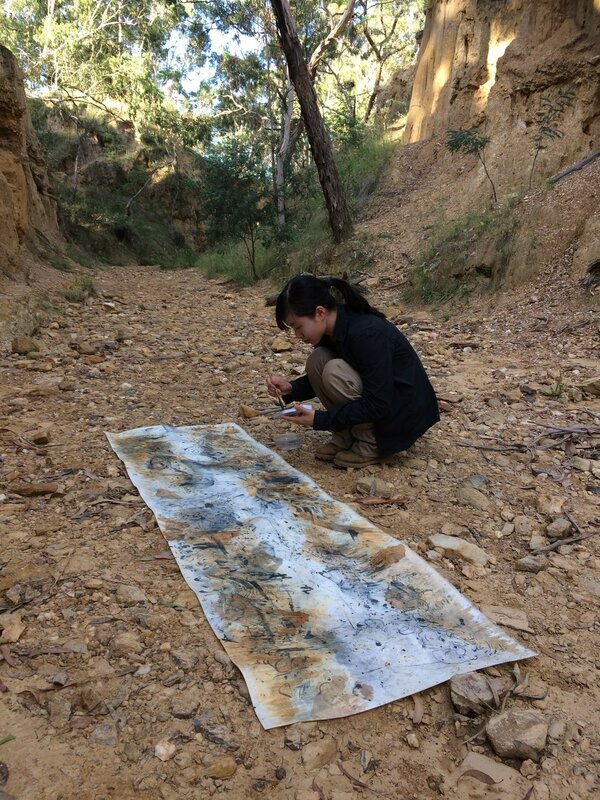 In my practice now, I’m putting my spin on the Australian Landscape, as a female Chinese migrant artist, as I hear it. I operate subversively, outside of their realm. Visited the Visitor Information Centre and Museum. I realised that the 19th century historical connection to gold and commerce holds no interest for me. Such economical interests do not move me, and there is no spiritual heart here. It is the history of Hill End artists which I am responding to, that stable of white, european males who are the default heroes through whose eyes and values Australian landscape painting history is filtered. Jeffrey Smart, Donald Friend, Russell Drysdale, Brett Whiteley, those well known names mentioned in the brochure. 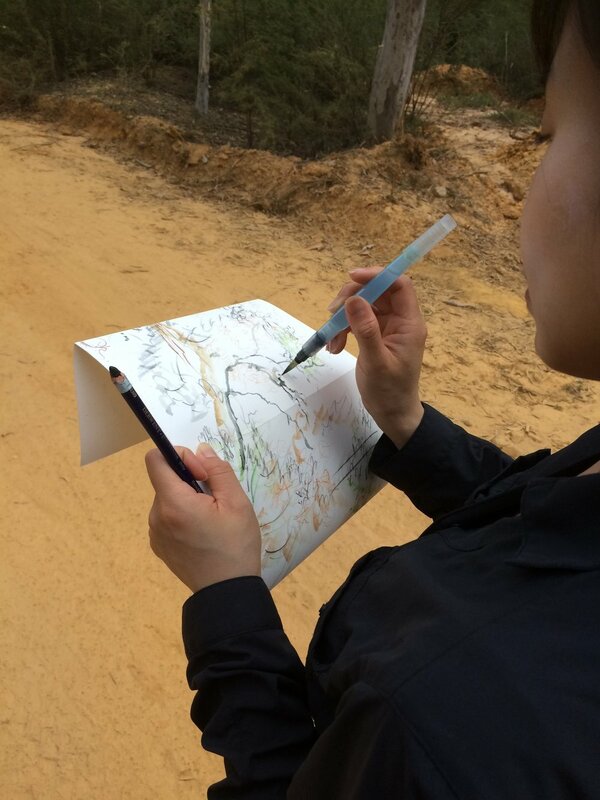 I had originally intended to make a Walking Scroll and Binaural drawing on the Bald Hill walking track, but now I think the main street is more appropriate. Hill End as a place is the town and this is what I am documenting. I will have to do these works in the early morning before it becomes too busy. Began the Tunic series in the morning. 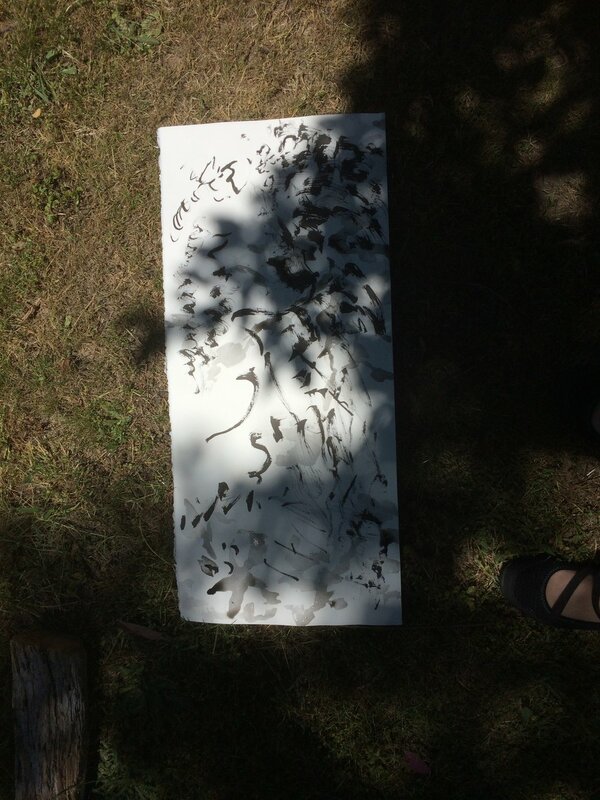 After doing brushwork while wearing the paper, I laid the piece down on the grass. The grass in slanted morning sunlight created blades of shadow on the edges of the paper, so I decided to use this as an indicator of time (7:30am). 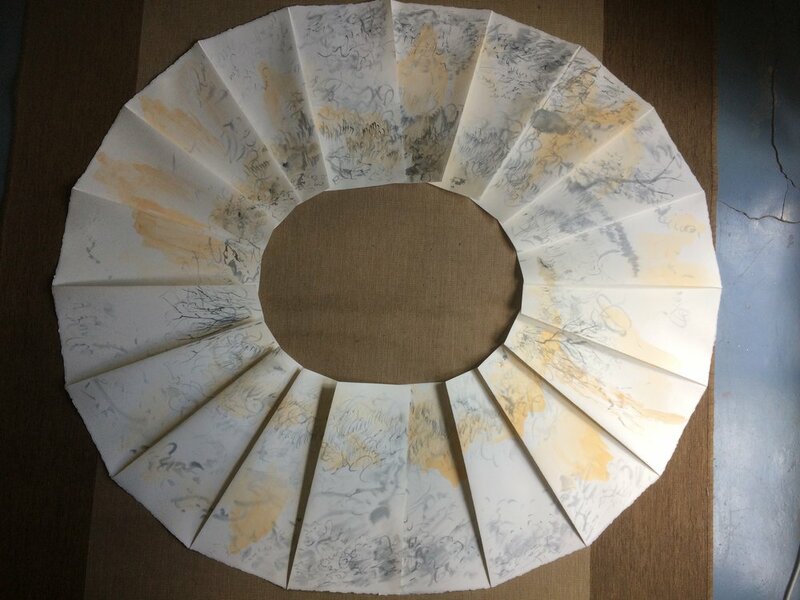 The noon piece has dappled grey toned shadows from the trees above which were made with washes of black ink. 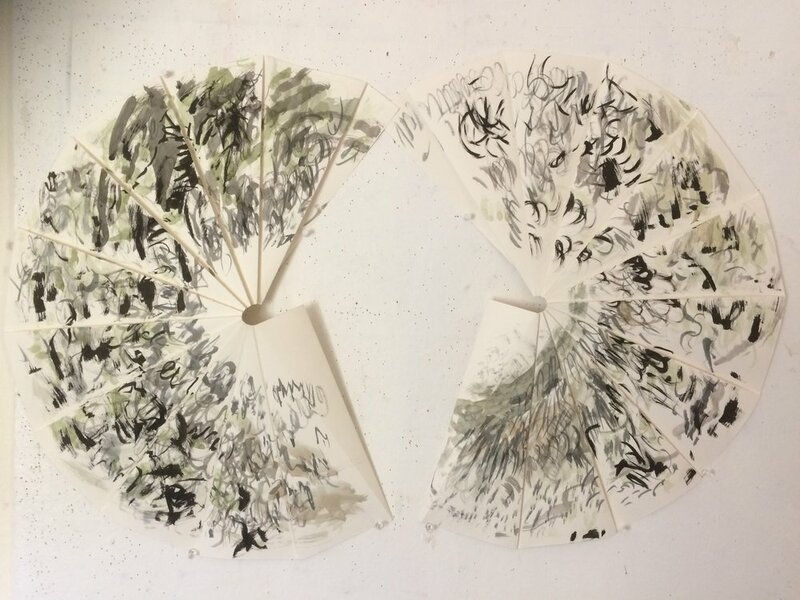 I had forgotten to take into account the deckled edges of the paper when choosing pieces for morning, noon and evening, but it was a happy mistake as the sequence I will place the drawings in (noon, evening, and morning) implies ongoing cyclical relationships rather than a predictable beginning, middle, end. The afternoon session was made at 5pm. Again, I used shadows of grass to indicate time, however, I am not so satisfied with the resulting composition of this work and may use the other side. I also completed a third session on the Binaural Cottage drawing. I dampened the paper so that marks made with Inktense pencils would bleed. The bleeding was minimal as I had let it dry for a little too long, but the fine pencil marks amongst the black ink was quite lovely. I tried the same technique for the Pleated Arc piece, however, as the paper was much more damp, the pencil marks bled more. Oddly enough, the whiteness of the paper appears more stark with the introduction of colour into the composition. Today was spent exploring Tambaroora and Golden Gully in the morning, and Bald Hill, Merlin Beauty and Kissing Point Lookouts in the afternoon. I also paid a visit to the local tip which was a sad and fascinating place. There is no capacity for recycling here, so I will put all my paper, plastic and cans together to take back to Sydney. Tambaroora was frankly rather depressing. I don't know what I expected, but I certainly didn't expect such an overwhelming feeling of desolation. I felt like I was constantly searching for something, but unsure of what it was I was looking for. The spirit has fled this place, sieved out of the water, crushed and hacked out of the quartz along with the gold more than 160 years ago. I can feel the sad, empty barrenness of this land, missing the people who cared for it. There were campers and gold diggers with metal detectors, still hunting for more to take from this place. The only thing they return to it is faecal matter. Golden Gully had more life, it felt like the birds and insects were returning to heal the ecosystem after the devastating effects of human greed and commercial enterprise. The truth is, I don’t genuinely like or feel connected to this place. I miss the shoreline and proximity to bodies of water. A key theme I noticed was the breaking apart of stone, and of land, resulting in deep fissures. 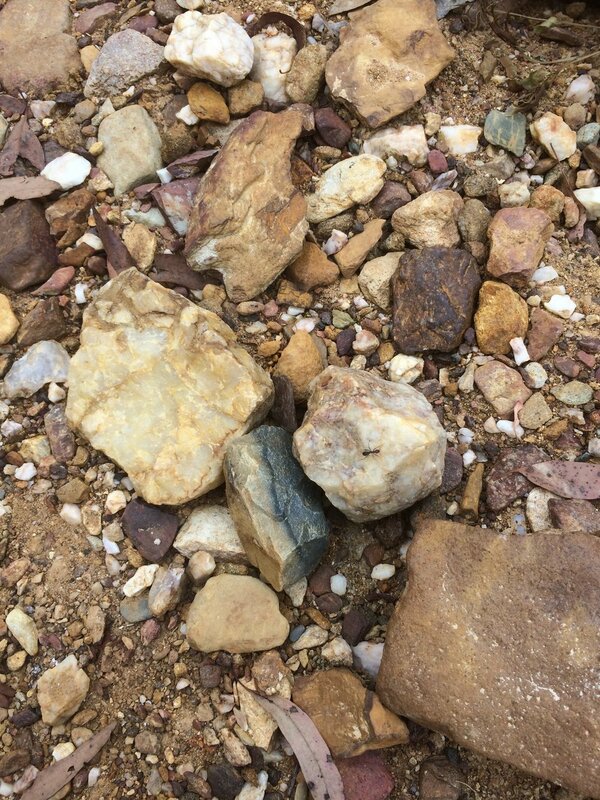 Quartz cracked by force, people finding lines of weakness to exploit in the earth. 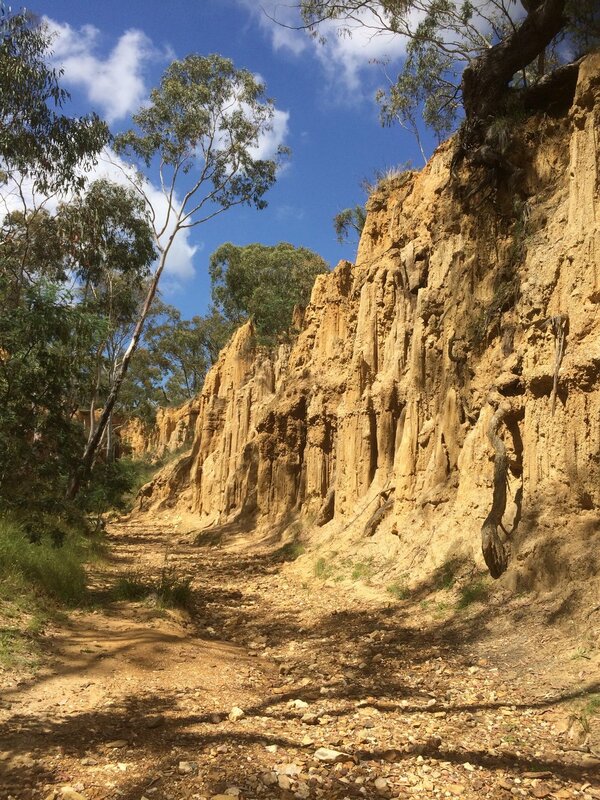 Gullies, fissures, Split Rock at Kissing Point lookout. 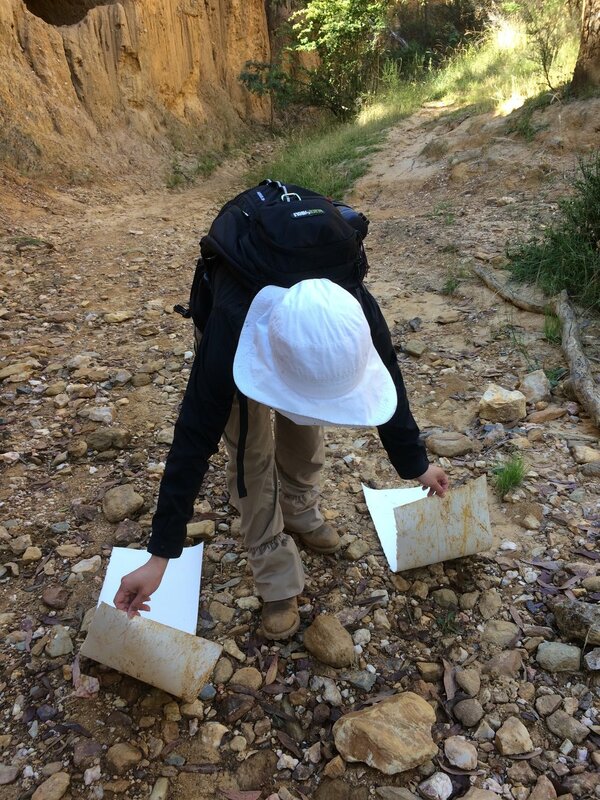 I am keen to focus on Golden Gully as a major site of investigation. Will need to drive to Bathurst to purchase more paper. Around 6:30 in the afternoon, I turned the third Tunic drawing around and started a new drawing on the back. Much happier with the result of this piece. First drawing session at Kissing Point Lookout. The sound of insects was intense. They seemed to have a consensus on when to increase and decrease in volume. I also thought I heard hooligans galavanting in the valley, but it may have been other animals. There was a bird that sounded strangely like human whistling. I managed to do two sessions, one with dark ink and the other with a mid tone. This place strongly impressed upon me the silence of images. No painting is able to capture the frenetic intensity of several species of insects in chorus. 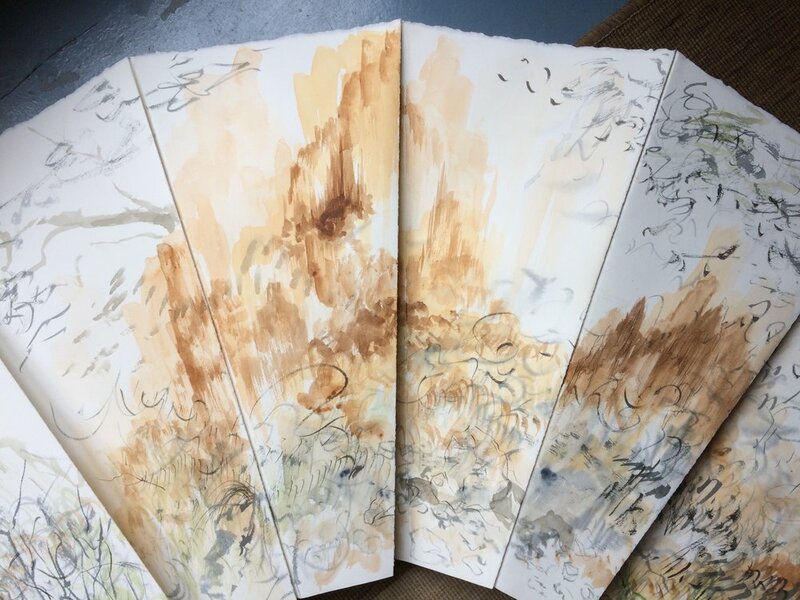 These drawing devices capture the fresh moment of hearing wind, insects and birds, but they do not allow for coherency or organised mapping as with notation. These drawings are genuinely raw data and are undecipherable to anyone other than myself. I think I am struggling between this and the desire to create drawings which are visually ‘readable’. In the afternoon I worked on the Midday Tunic and did a second session on the reworked Afternoon Tunic piece in lighter blue toned ink (ground on suzuri). The result was nuanced and beautiful, I don't think I should do more on this work. The Midday Tunic piece was worked on with Inktense pencils and the result is chaotic. I think this method needs to be reconsidered. A third session with the brush pen and Spring green Inktense pencil looks ok.
Added colour to the Morning Tunic piece and was moderately happy with the result. The calligraphy marks are too large and strong for the space, I am actually not too fond of the composition. There is a tension between making something visually pleasing and being true to the drawing experiment. But making a work which pleases is a part of the art making process and cannot be discounted as a condition. This is why the scientific model cannot apply unaltered to experiments in the arts. Human agency and desire plays a large part in making art. The works made in the first week of this residency reflect my unease, tension and discomfort. The large Binaural Cottage piece is roughshod and clumsy. I cannot undo this. There is nothing to lose, so I shall continue with it (or unstitch it and try to use the other side). 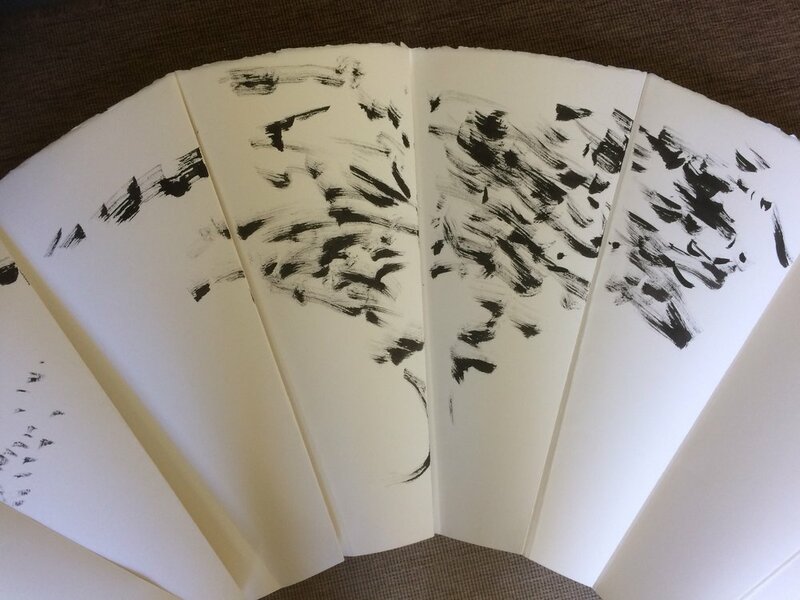 The Pleated Arc cottage piece has beautiful calligraphic marks, but I have since found that the Ink tense pencil medium is not compatible with the graceful brush strokes. They are clumsy and lacking in expression by comparison. They work better on a smaller scale. As a result, I have wet and laid out the Pleated Arc in an attempt to use the other side to start again. I will also rework the Morning and Midday Tunic pieces. The Afternoon Tunic piece looks finished to me and I will leave it for now. This morning, I learnt that pairing the spring green with charcoal grey on the same brush, creates a sense of luminosity of mixed colour. 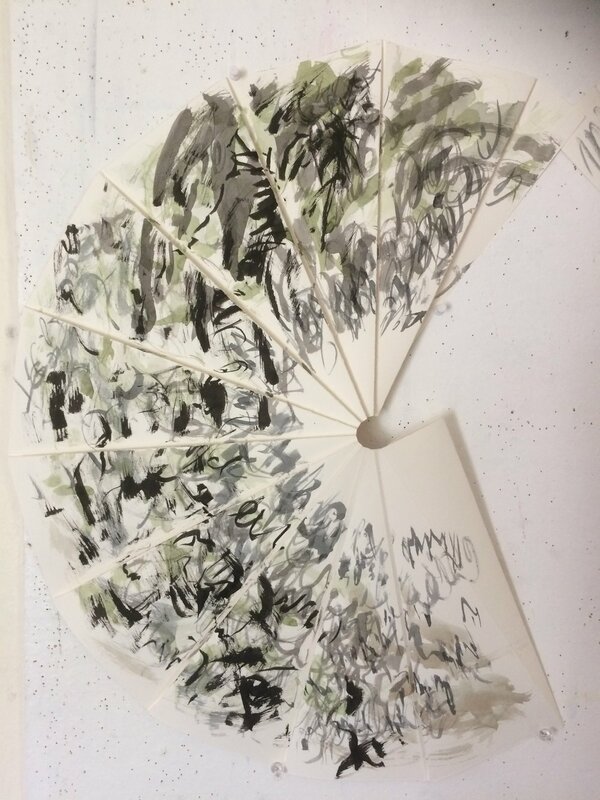 I shall attempt this on the Pleated Arc piece as I layer it to capture the dappled light of the leaves. Tomorrow I will go to Golden Gully without black ink. I want to start with watercolour washes to capture the rich ochre colour. I have the Binaural and Pleated Arcs to work on. What I have learnt from the first week’s drawings, is to begin lightly and apply layers progressively. The black was too powerful and left no room for negotiation. Commencing straightaway with such a strong statement finished the drawing at the start. The Binaural KPL is a work I am happy with, but will add colour to try pushing possibilities. I believe Inktense Leaf green applied with brush pen will be the most subtle and reflect the colours of the eucalypts. I will also need to punctuate with the few bird calls that crop up which sound like whistles. I also need to accept that there is no wifi for my dongle here. After driving to Bathurst to purchase an external antennae, I come back to find that it makes zero difference. Useless. 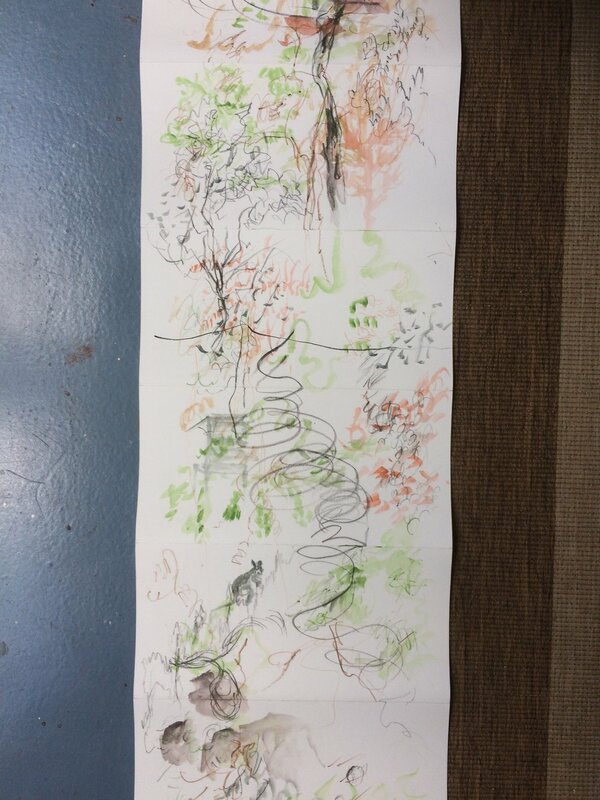 Did another two layers of drawing on the Walking Scroll Cottage. I have decided to work continuously in light layers on this piece. 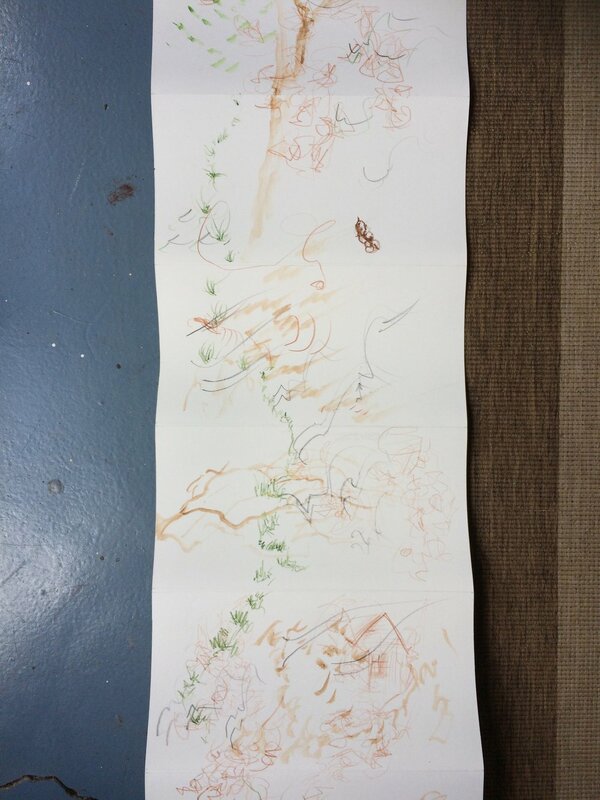 Completed a morning drawing and recording session at Golden Gully from 8:45 - 10:30am. 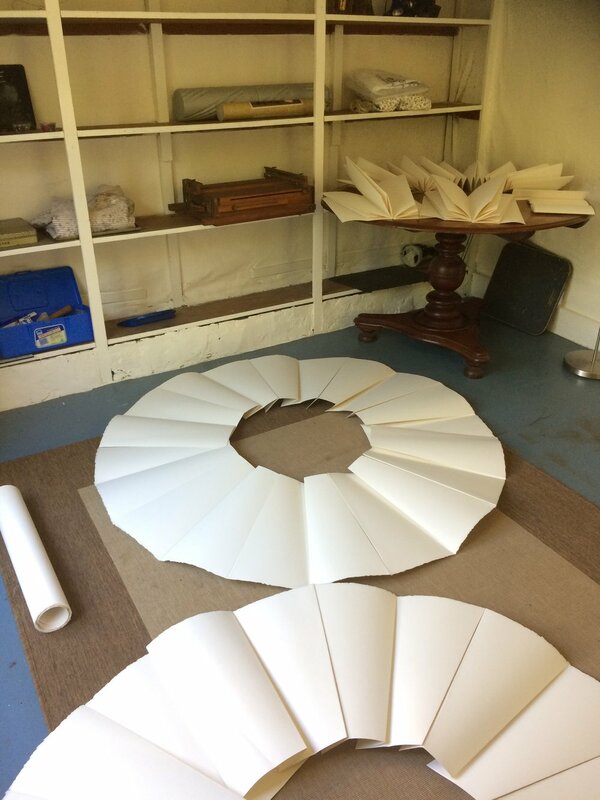 Worked on the Binaural and Pleated Arc pieces. Very fruitful session, and by 10:30, it was starting to get quite warm. The gully is secluded and sheltered from the wind. The dominant sound was the thick buzzing of several species of flying insect, although there were also occasional bird calls close to the arch. Made a long 32 minute recording, walking and pausing, from the beginning to the arch. 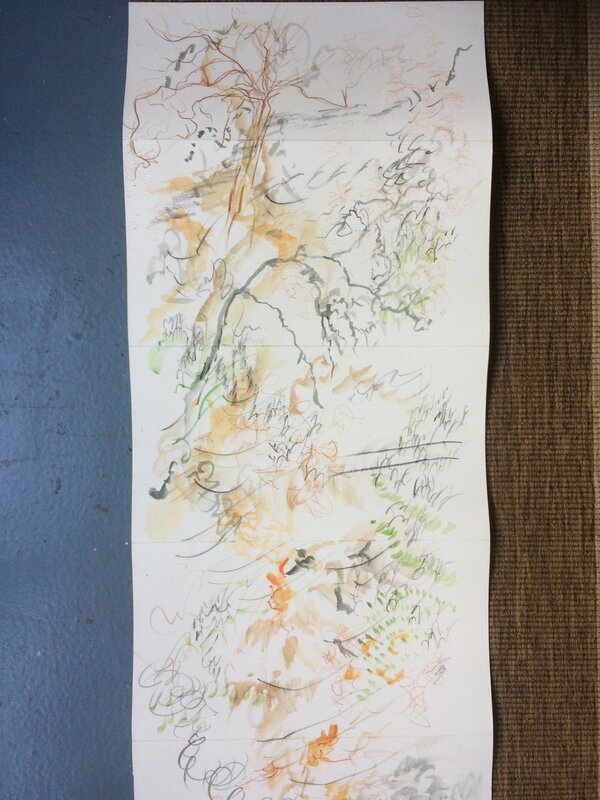 The focus of this drawing session was on the visual impression of the gully. As it is such a secluded place with no mobile coverage, I have decided that it is much better to work on the sound element in studio, to halve my time spent there. The flies were quite delighted with my work, landing with raindrop-like thuds on the paper constantly. Their tiny footprints are fascinating to observe on the paper. There is also a small family of Rosellas in the Gully. I hope that I will see them again. I unstitched and wet the Binaural Arc Cottage in order to use the back for a new drawing. Woke to the rain this morning. Decided to make the Morning Tunic drawing splattered by rain drops. Began around 7:45. Did two layers of light and mid tones. The splashing of drops was subtle but still softening and effective. At 8:30, I began the Pleated Arc Cottage again. All dissolves, in a day of steady rain. There were beautiful effects being created and washed away by the steady drizzle. I was only able to capture them by camera for they did not stay on the paper. By 10:30, the paper was too wet and I had to pour excess water off and cover with a sheet of plastic for it to dry out a little. I then decided to stitch the Binaural Cottage piece until lunch time, ready to be redrawn. After lunch, I worked on the Pleated Arc for another few hours and by now the rain had ceased. I managed to add several coherent layers and used a stronger, warm toned ink for a final layer. 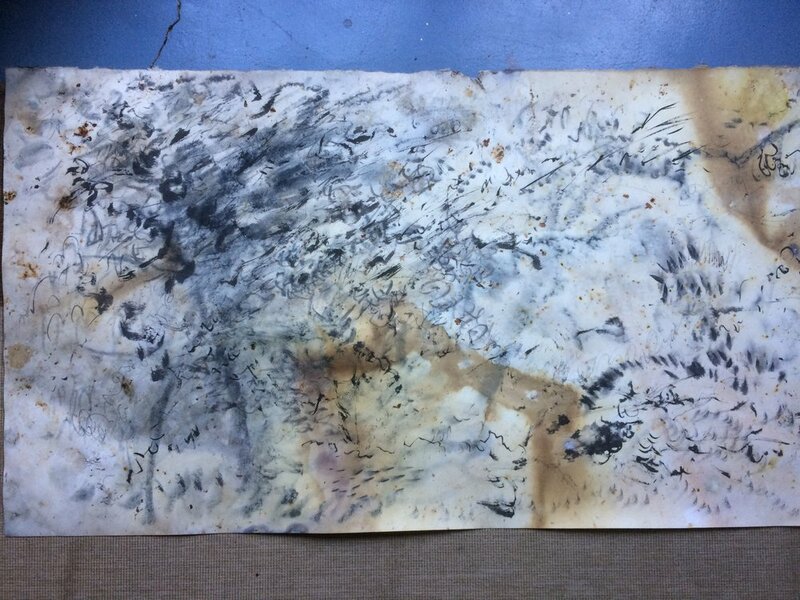 Working with ink and rain in this way is a perfect visual metaphor for the ephemeral nature of sound and its constant erasure and re-scribing on our consciousness through perception. It would be great to document it as a performance piece. The plastic cover allowed the pressure of further rain drops to come through and create a dappled effect. I shall see what the drawing looks like tomorrow after drying. No doubt it will need areas of accent. Torrential rain today. Almost constant downpour in the morning. The roof leaked in several places; living room, kitchen, a tiny amount in the studio. I woke early and added colour to the Morning Tunic piece, allowing rain to splash on the watercolour. The effect is beautiful, but it will need a final deeper layer of black tones for focus. It will shower again tomorrow, so I shall use the rain again. I also worked on the Binaural Cottage piece in the rain. The first soaking was a beautiful moment of peace and abandon. I had to dry my clothes in front of the oven. I did three or four layers and I feel that it is finished. I spent most of the day on this, drying off in between sessions. I shouldn't touch it for a few days. Not sure if I should add colour. 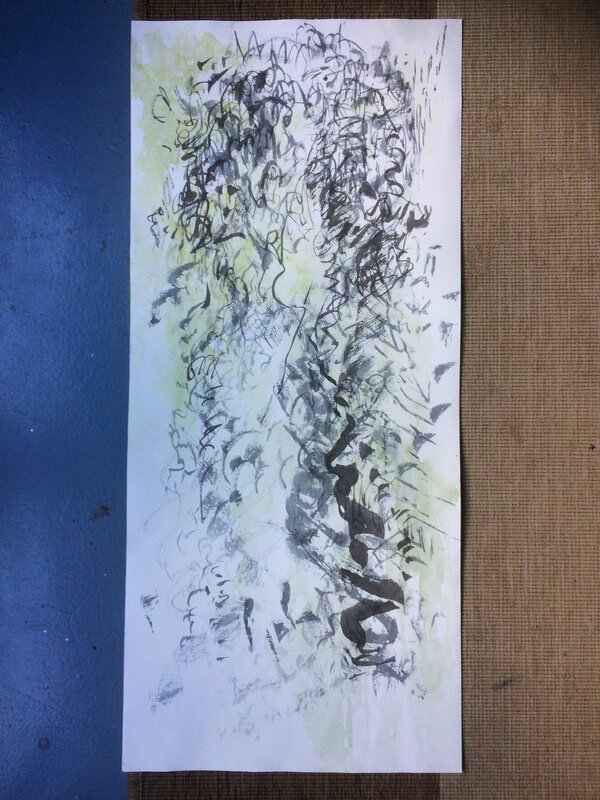 Did a couple of layers on the Cottage Walking Scroll using sumi and brush. The work feels finished. Also did a couple of recordings of the rhythms of the rain, from drizzle to downpour. The tin roof, terrible for internet reception, is great for sound. I also managed to capture the birds and insects reviving when the rain stopped for a short while and the sun reemerged. It is amazing how responsive they are to the changes in sound and light. Around 4:30, I drove to Kissing Point Lookout. The slopes were wreathed in mist after the rain and the colours of the soil, tree branches, leaves and rocks were all intensified by the soakage. It was very beautiful and I took many pictures to work from. I also made a couple of recordings. 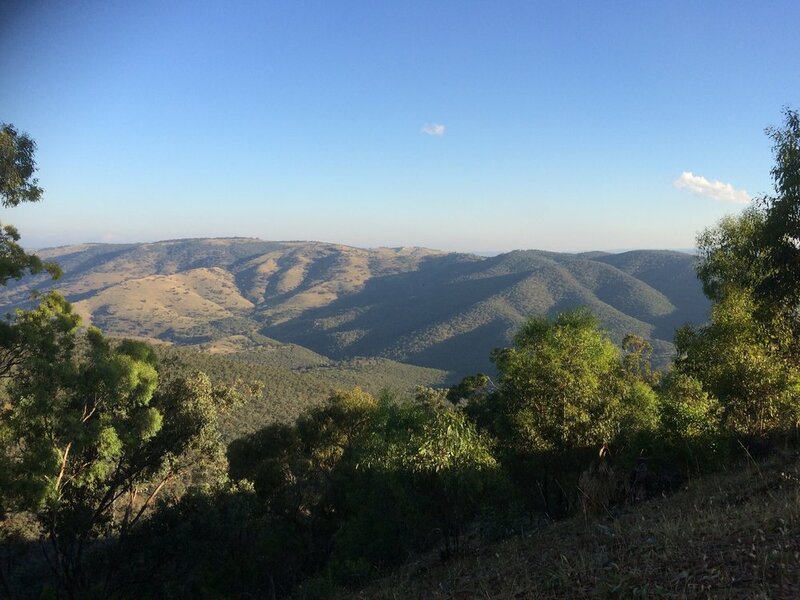 This is not the best site for proximate recordings of birds as they are mostly far below in the valley and rarely like to come to the exposed lookout. However, you do get a sense of immediacy with the insects, and distance with the birds. Morning Tunic Drawing. Almost finished. I did another layer in darker ink around 8:30am, however, I feel as though it needs some darker points of accent with the premixed sumi ink. Cottage Table Scroll. Finished. It was soaked through from two days of intense and constant rain. The colours from the wood blocks, leaves, plums, all intensified into deep, rich browns, golds, musty pinks. I did one layer of drawing around 9:30am, with the blue toned ink. As it was very wet, the ink dissolved and dissipated beautifully into ghostly memories on the paper. Just before lunch, I did a second layer of darker ink when the paper had dried out more. The completion snuck up on me. It was finished without my having to put any final marks. I knew exactly that I needed to stop. Noon Tunic Drawing. I began again on the other side and created two layers in different tones. It looks finished, but I feel like I could push it with some colour. I am tempted to lay it on the ground weighed with blocks of wood in the storm, but this work is different. It is more of a cerebral exercise, rather than collecting physical traces of the environment. It is interesting that even with the tunic drawings, there is a distinct sense of orientation in the works. I realised that I was subconsciously altering my marks to account for the viewing direction, effectively drawing upside down on myself. Similarly, I could have walked around the table, but subconsciously chose to create it from the cottage side, facing east. Therefore, the composition looks most correct from this orientation. After lunch, I decided to make full use of tonight’s forecasted rain for the Golden Gully Ground Scroll. 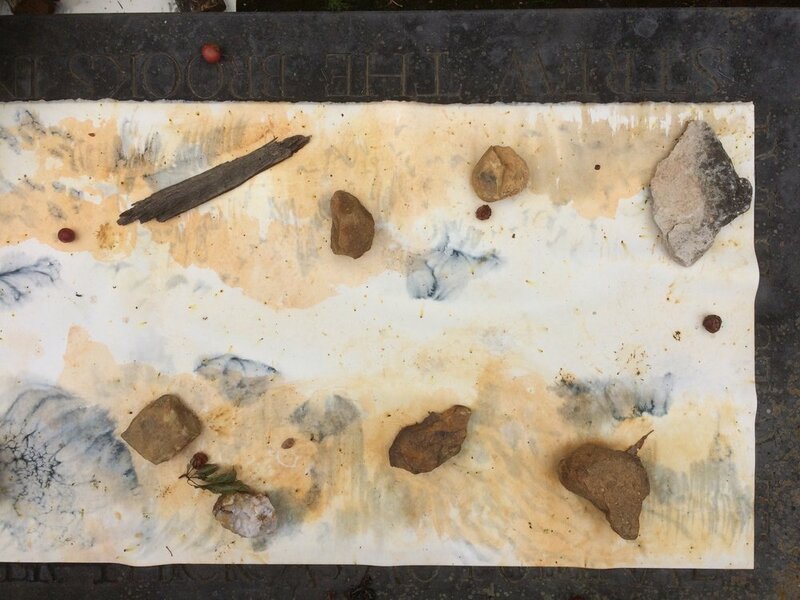 Not being able to leave the paper there for ten days, I decided to collect rocks and bark from the site and use them to weigh down the paper during the rain, and so I could paint around them. 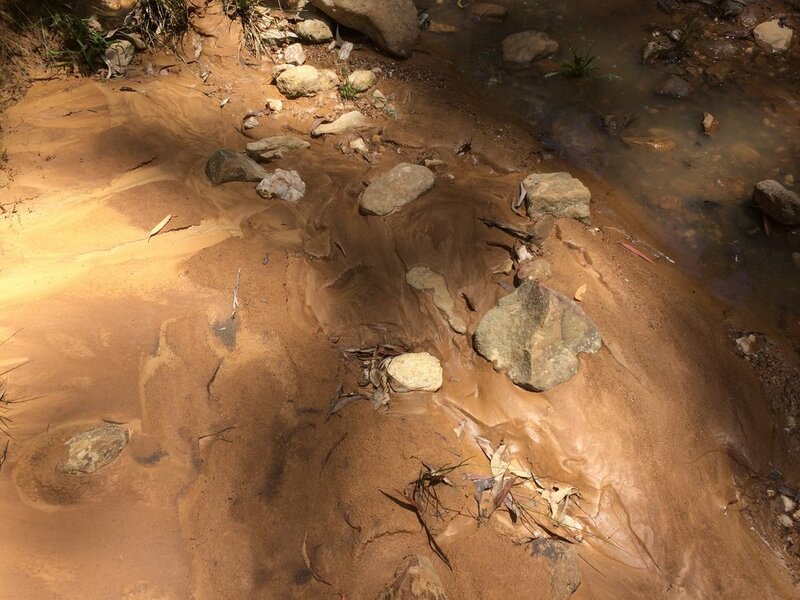 The Gully had actually become a tiny flowing creek after the rain and the soil was deep gold and viscous underfoot. I laid the paper on the water and walked across it, but my footsteps left no permanent impressions. 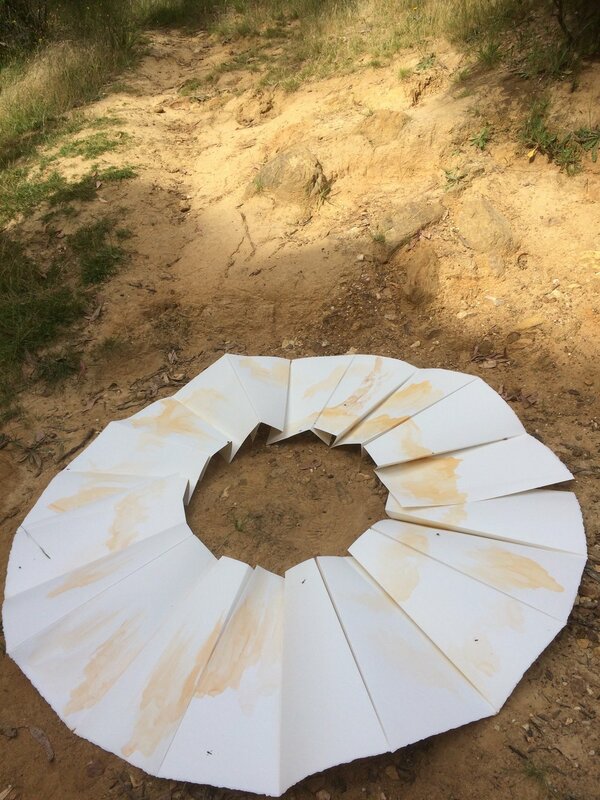 I then removed the paper from the water, took the soil from my boots and used it to smear forms of the Gully walls along both long edges of the paper, creating a tunnel of white. 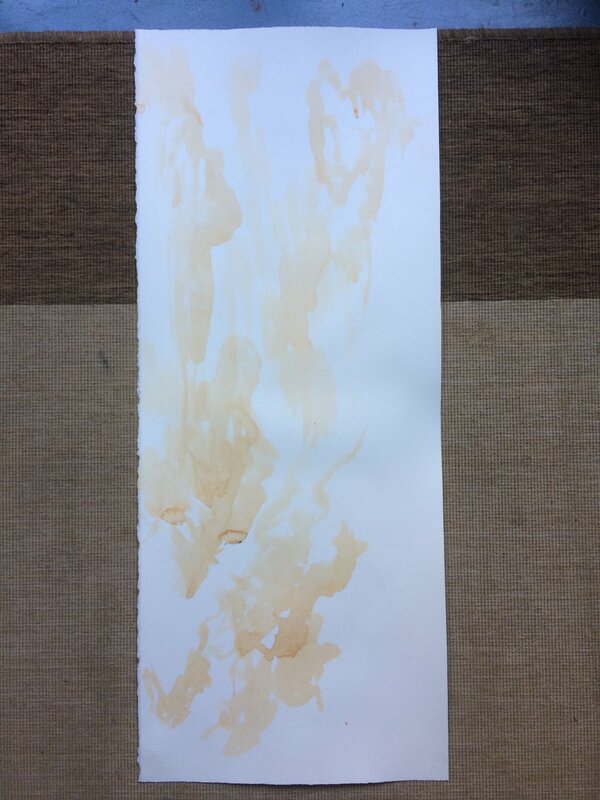 Hopefully the ochre will stain the paper permanently. After this, I painted Gully wall forms with watercolour. 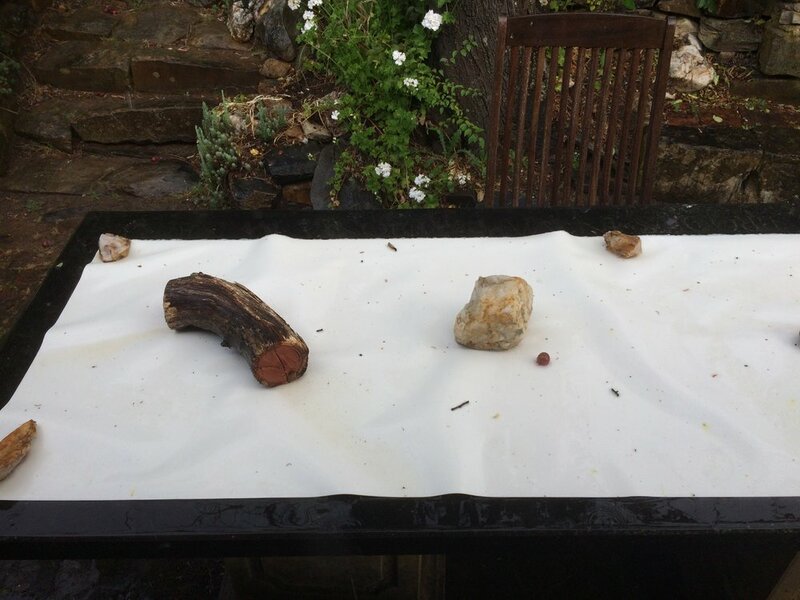 The paper is now laid out on the stone table, awaiting the rain. I apologised to the Gully and informed it that I would be returning its stones in about ten days. Around 8:30pm at dusk, there was the most intense sound of frogs coming from the bush near the sink in the backyard. I got a recording, but had to lower the levels to 67 as it was clipping from the high pitch. There were also kookaburras on the fence and electric lines. 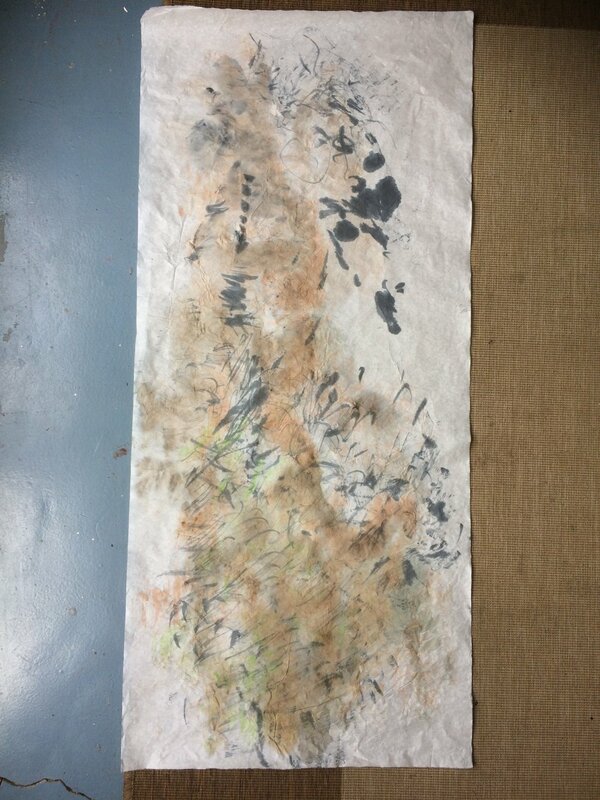 As some of the ink of the Cottage Table Scroll had lightened and dispersed in the moisture, I added some points of accent to existing marks after the paper had thoroughly dried. No major changes, just punctuation points. Otherwise, today was mostly a day of rest and washing. Worked on Golden Gully Pleated Arc and Binaural drawings in studio today by playing recordings through paired speakers and referring to photos. I found this method to be more effective with the Binaural drawing, as there was a distinct stereo effect that corresponded to the binaural layout. 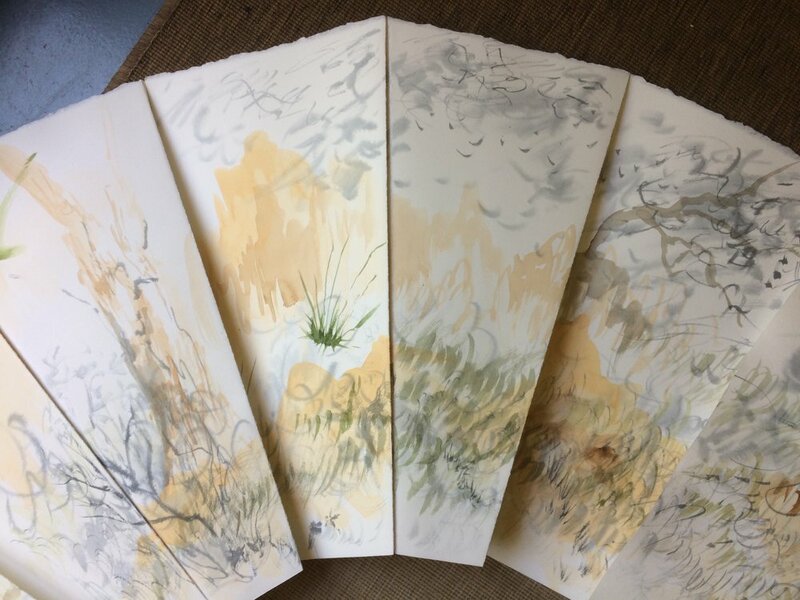 I thoroughly wet the paper of each drawing to achieve the dissolved transparent layers which were so effective in the Cottage series. The Binaural piece was difficult to work with thoroughly wet, as it became quite floppy. I eventually placed the work flat on the ground on either side of me as I could no longer clamp it between my knees and draw effectively. It actually worked quite well and I was still able to capture the binaural effect of depicting what I heard on each side. It is almost like a percussion instrument, a pair of cymbals. I would consider alternating this technique and the original for the remainder of the drawing process. It is much easier to concentrate on the sound when one does not have a feeling of urgency originating from isolation. Regardless of where I am, if a place is out of my comfort zone, my mind is never completely able to absorb and respond to creative stimulus. I’ve been thinking a lot about David Seamon’s notion of ‘place ballet’, how daily repeated actions in familiar contexts allow one to dispense with actions of survival, and engage in more creative thought patterns. This is what being in a studio context allows one to do with listening. When I am in an unfamiliar environment, I find that sight dominates in order to help me ‘keep an eye out’ for danger and survive. In studio however, I can close my eyes and concentrate on the sound and its interpretation. I walked to the post office in the afternoon. Upon entering, I was greeted by the nostalgic smell of cigarettes indoors. Sure enough, the ancient post master was smoking at his desk. I love how standard rules and regulations from the past ten years are ignored here. Time stubbornly kept still. While walking the now familiar route past the Bridle Track entrance, I was able to do momentary walking meditations. I think I am beginning to develop place ballet with this route. Two weeks. Had intended to do a morning session at Golden Gully, however, the parking area was taken up by huge electricity service trucks, so I went to KPL instead. While there, I experimented with a wet frottage technique using wen zhou paper and watercolour. It was very frustrating in the wind and it was difficult to wet the paper, but I am glad I persisted as the result is very promising for further development. I will use a water atomiser to wet the paper next time and hopefully there will be less windy days. 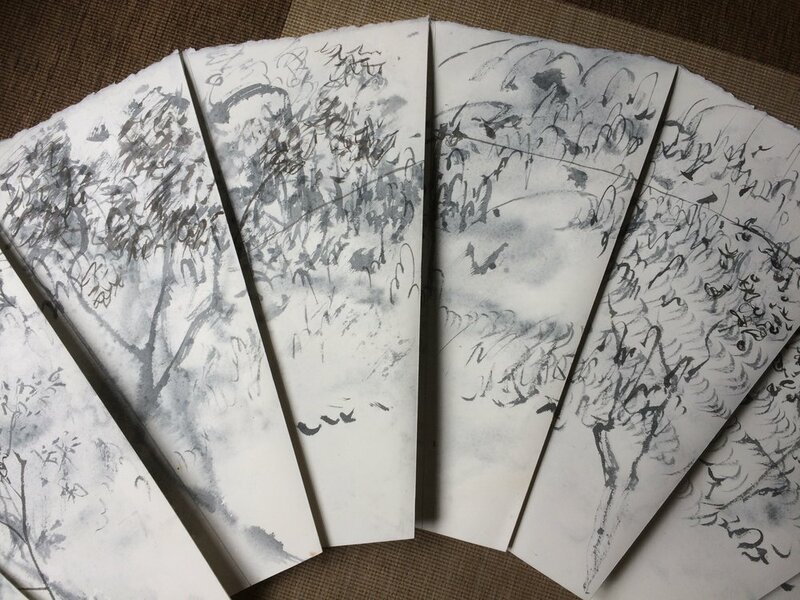 I will try responding to sound with watercolour gestures, or perhaps draw from recordings then do the frontage technique, not sure yet. A couple of ladies, Mercury and Jenny came to the lookout and stayed for a long chat. Mercury has lived in Hill End for a year and Jenny is visiting from Sydney. They informed me that the electricity would be out until 3pm (hence the service people at Golden Gully). 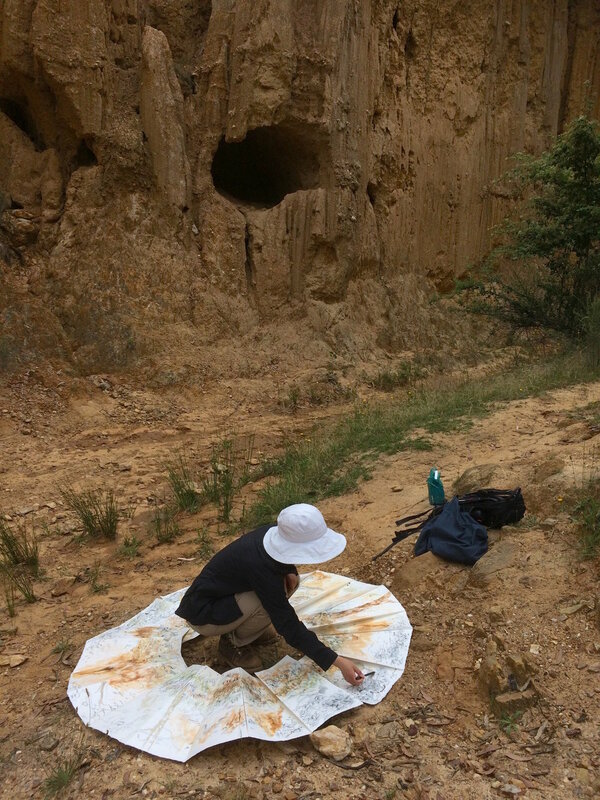 Around 4pm, I went to Golden Gully to work on Pleated Arc, Binaural and Tunic pieces. I realise that photos simply cannot facilitate my spontaneous perception of elements near and far, stones, a tuft of grass, these would not have made their way into my work had I not done further sessions. It was very hot and the sun still quite intense, however, I managed to do all of them, making a start on the new Tunic drawings. My skin feels a little burnt. Responding to visual elements with the tunic pieces was refreshing, as I realised I looked frequently at the ground and focused on textures formed by rain in the soil. I also managed to get a recording with the microphones close to the ground to focus on my footsteps. Unfortunately, it was still too muddy for me to put the microphones on my shoes, and difficult with gaiters. I will use this recording for the ground piece which is still awaiting rain. 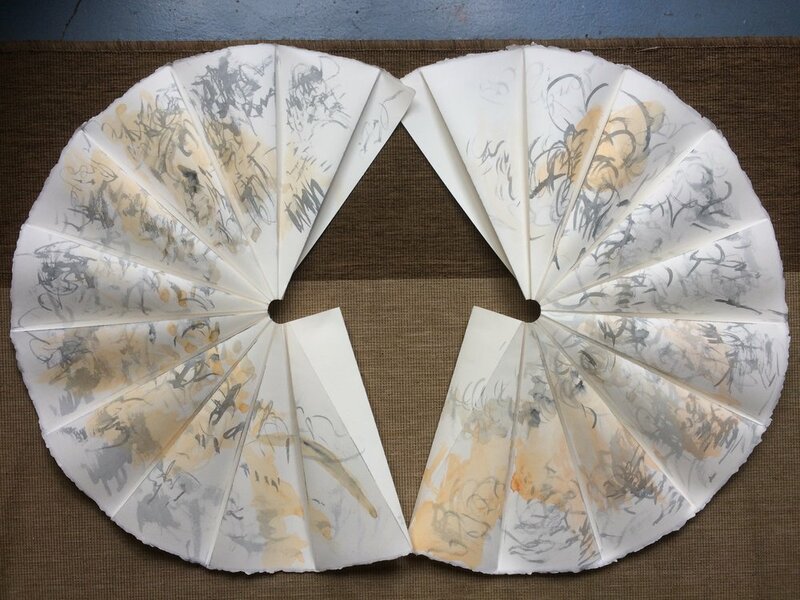 Did a few layers of ink and water colour on the Binaural and Pleated Arc Golden Gully pieces in studio using recordings. Unfortunately they do not feel resolved. I think I need to wait until I have translucent sepia and burnt umber inks with me until I do more layers. Unfortunately I had not documented the Binaural piece after Tuesday’s session. I spent the afternoon preparing a diagram and instructions for the Beijing Biennale application and could not do more drawings. 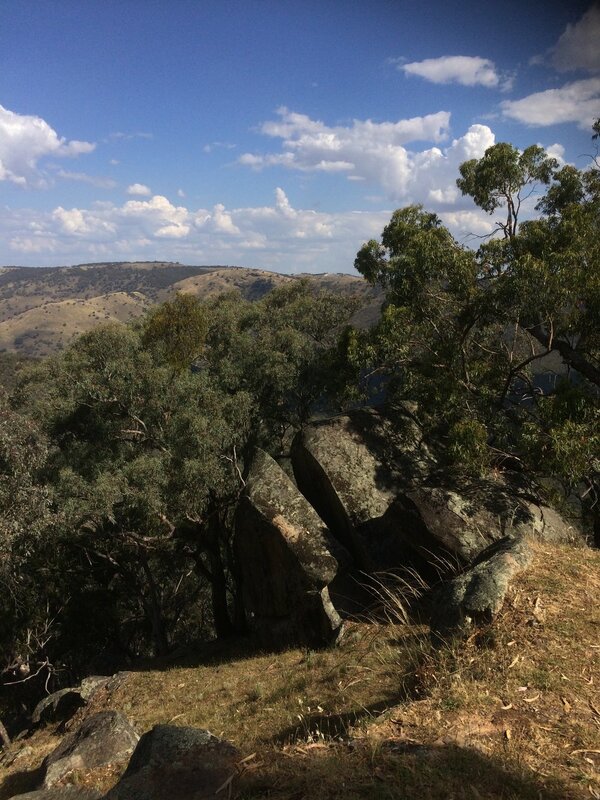 Spent the day in Bathurst preparing and sending the Beijing Biennale application and shopping for the coming week. In the afternoon I did a watercolour layer on the evening Cottage Tunic piece and a took a walk to do the Walking Scroll. I realise why the Tunic pieces are not working for me. The surface is too rigid and unyielding to have the characteristics of a garment which the name suggests. Looking at the watercolour frottage I did at KPL on Tuesday, I keep thinking how suggestive of bodily form it is. It is more Tunic like than the Tunic pieces. 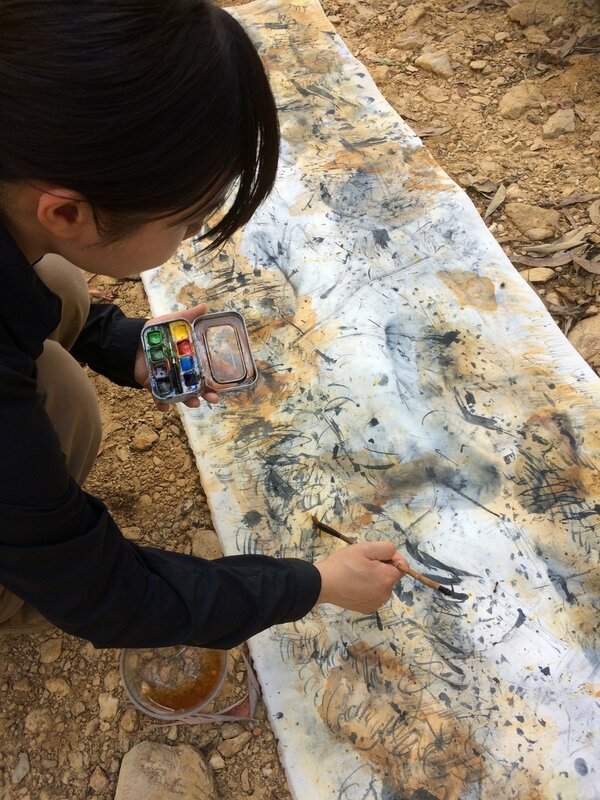 It made me resolve on creating a series of pieces with the Wen Zhou paper dampened, painting against my body with calligraphy, then doing a frottage on the rock of KPL and GG. I shall experiment with this tomorrow. On my evening walk with the walking scroll, the wind rustling through the poplar (?) trees was very alluring and lovely to draw. I realise just how much less responsive pencil is compared to the brush. Made a couple of Shroud drawings based on Golden Gully recordings. 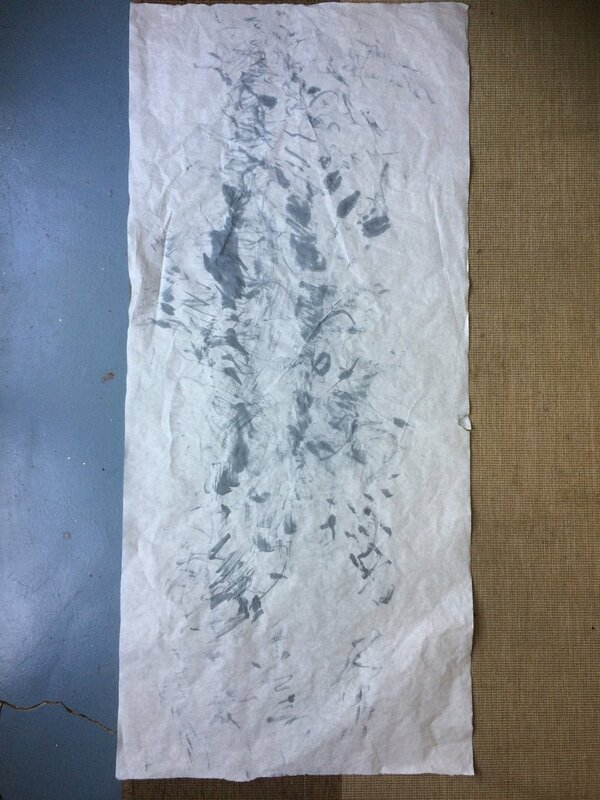 I moistened the paper and lay on the studio floor, covering my face to mid thigh with the sheet. 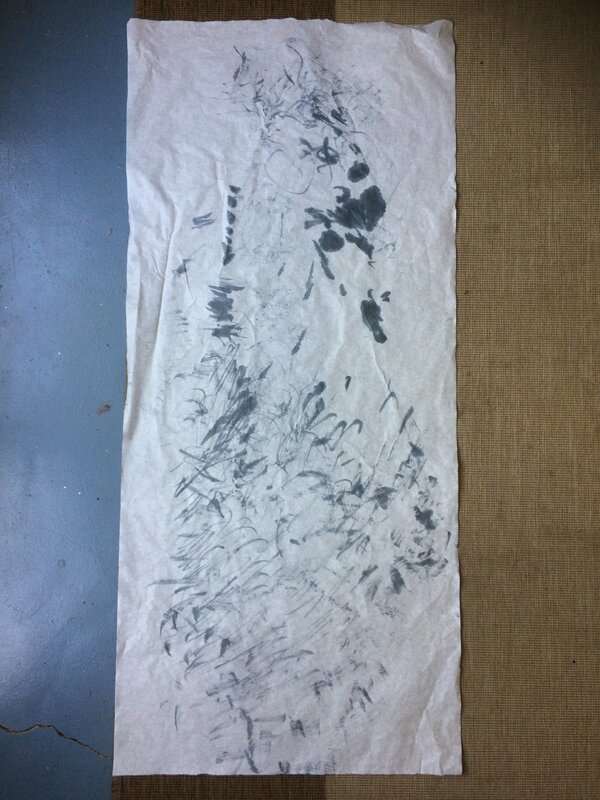 I then responded to the sound with ink and brush on my body. 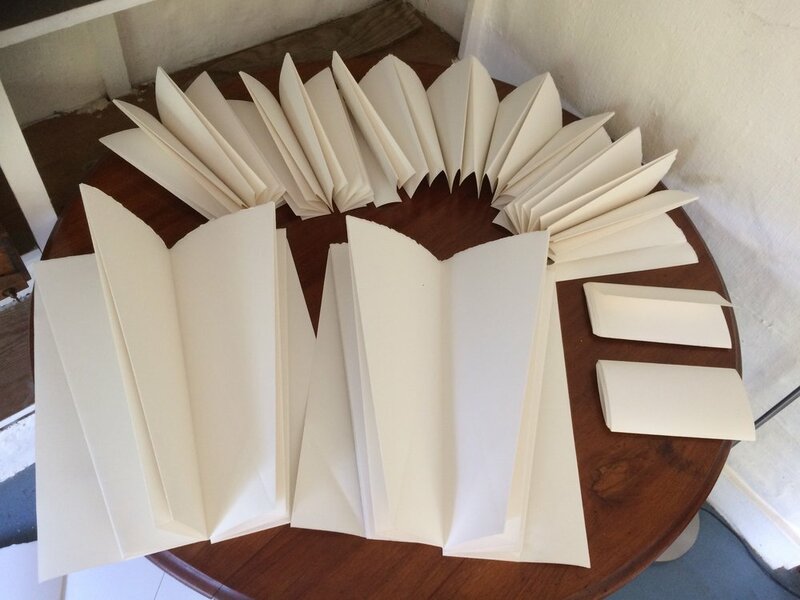 The haptic feedback was sensuous and more direct than with the stiff arches paper. 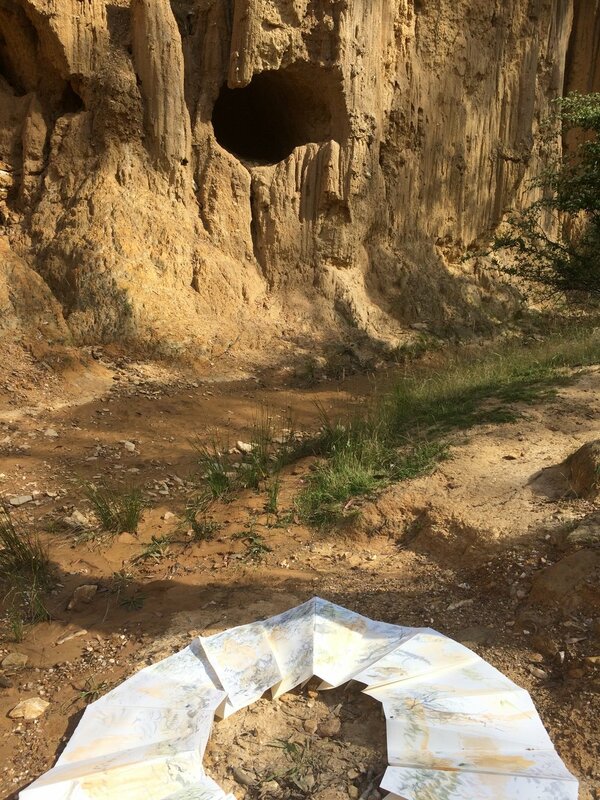 I realise that this method of working, responding directly, allowing the material to yield discoveries, is very different from how I work in the studio at home, mostly in my mind. It is more immediate, less cerebral, this method requires flexibility, improvisation and critical response to what is possible in the circumstances with the conditions and materials given. Also edited the first KPL recording for a session of Shroud drawings. This first recording is strangely haunting. There are sounds which are uncannily human: distant conversations, calls and soft wails, whistling. However, I was seemingly alone on that hill. When the eye can see, the mind starts to construct and compose. Did a final studio session on the KPL Binaural piece using the new edited recording. I think I should stop. It started out well, but became too busy before it was resolved. In the afternoon, I went to both GG and KPL to do watercolour frottage on the rocks. I realise that the key is not to have too much water. The GG pieces worked better than the KPL piece because of this. The most coherent piece is one which I did on an unmarked piece of paper. 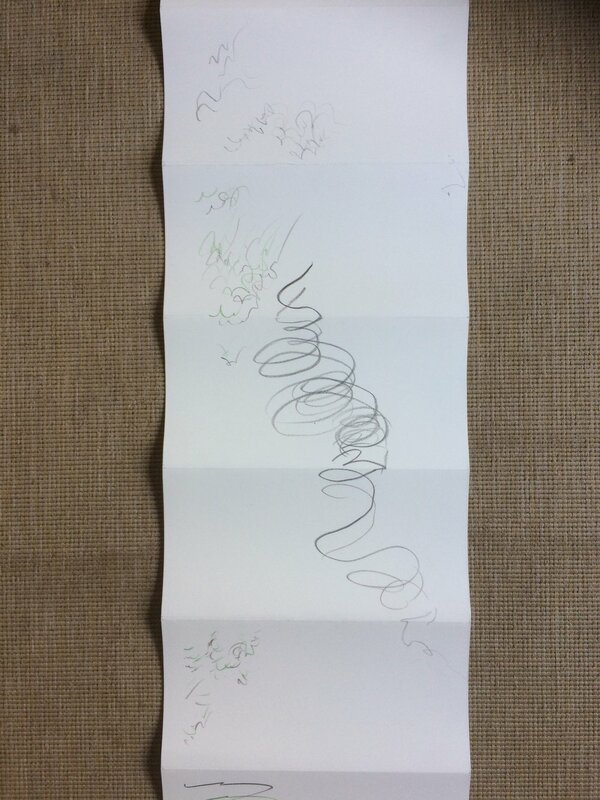 The other two had calligraphic responses on them which I had done earlier in the day. I realise that the pieces which have obvious visual references work because they contain understandable clues to the meaning of the work. 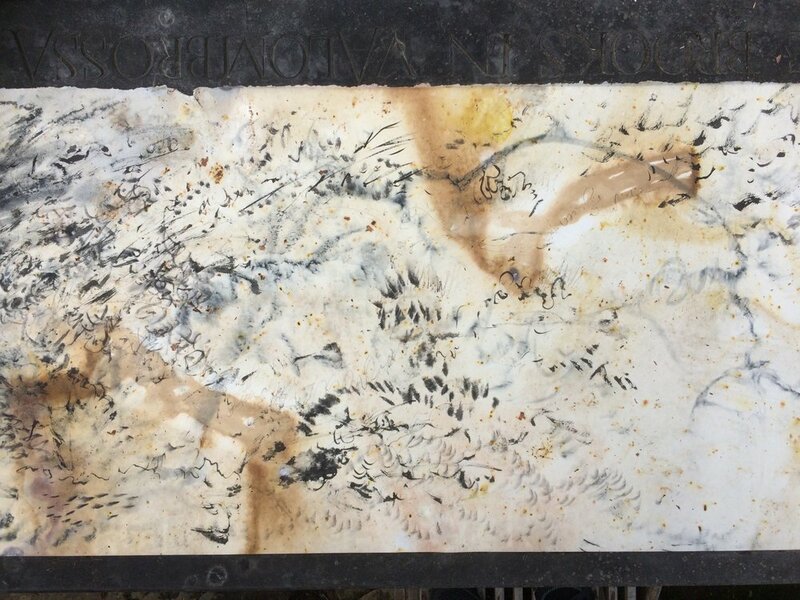 However, abstract calligraphic marks combined with the random composition created by the rocks is more difficult to grasp and the power of aesthetic affect becomes a more important consideration as the work is purely abstract. 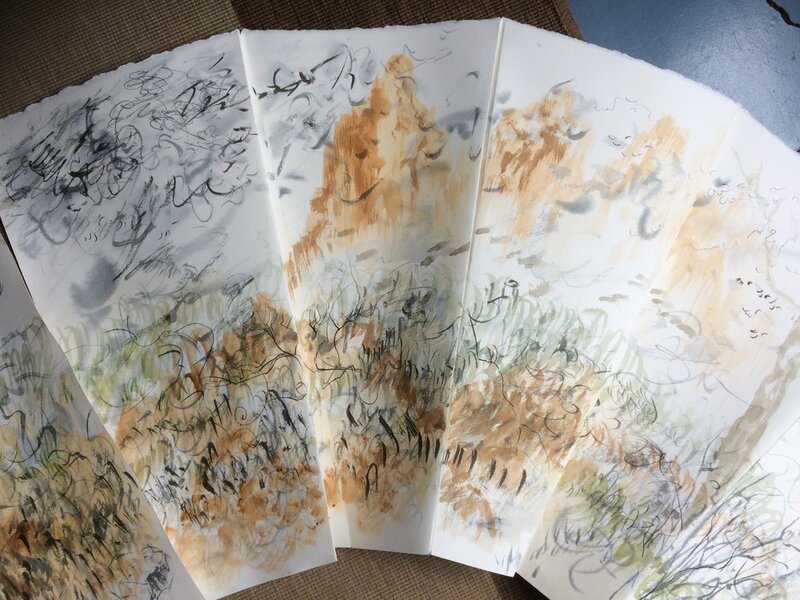 I am still undecided if this process of layering calligraphic response with watercolour frottage (a tactile response to the surface elements of place, and a different way of gathering visual information) will actually work. A response to the sonic, during the frottage process may be more effective. There was a thunderstorm and downpour last night which helped to make my GG Ground scroll wet and slightly more weathered. 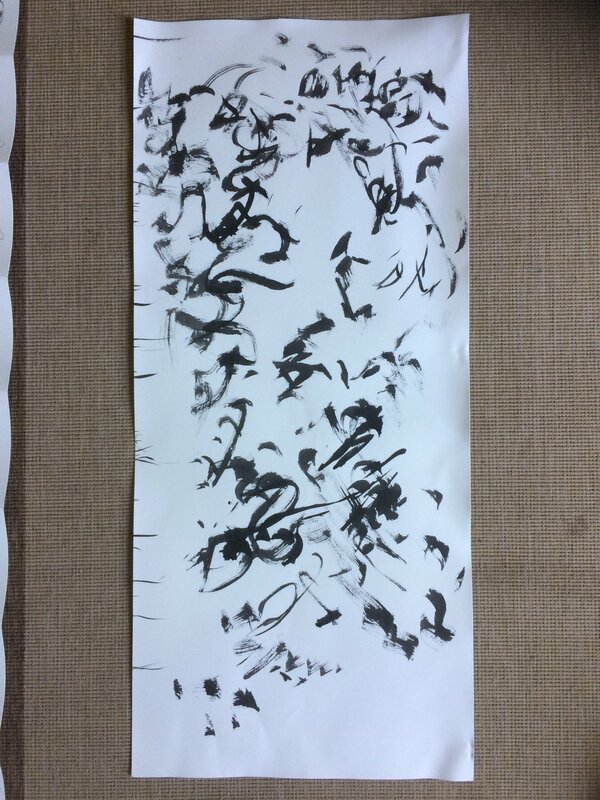 I added some calligraphic responses with sumi this morning which diffused and bled into beautiful patterns. After lunch, I used watercolour to paint some of the rocks weighing the piece down. I feel that this work needs to be a balance between wet and dry. Rock and sandy grit makes me feel that charcoal and a dry response must be added, although the gully is essentially a creek after the rain and water creates beautiful patterns in the soil. 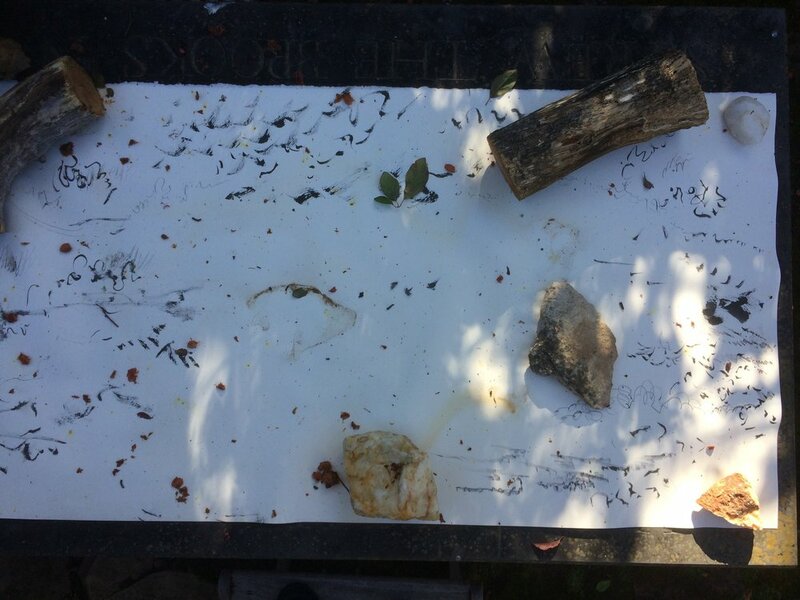 The crunch of rocks and soil is solid, while the ephemeral call of birds and insect buzz suits the wet ink layers. 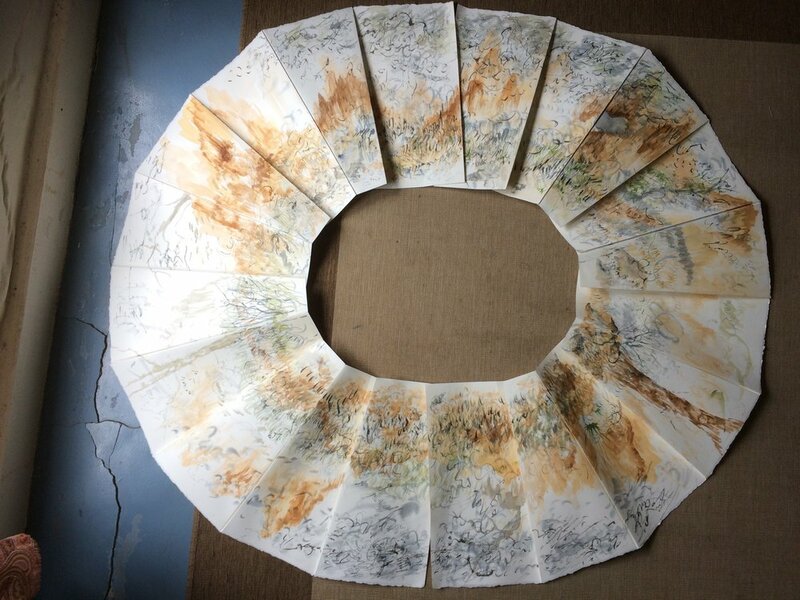 Looking back over the images of the watercolour frottage done on the calligraphic responses, I realise that it doesn't really work. 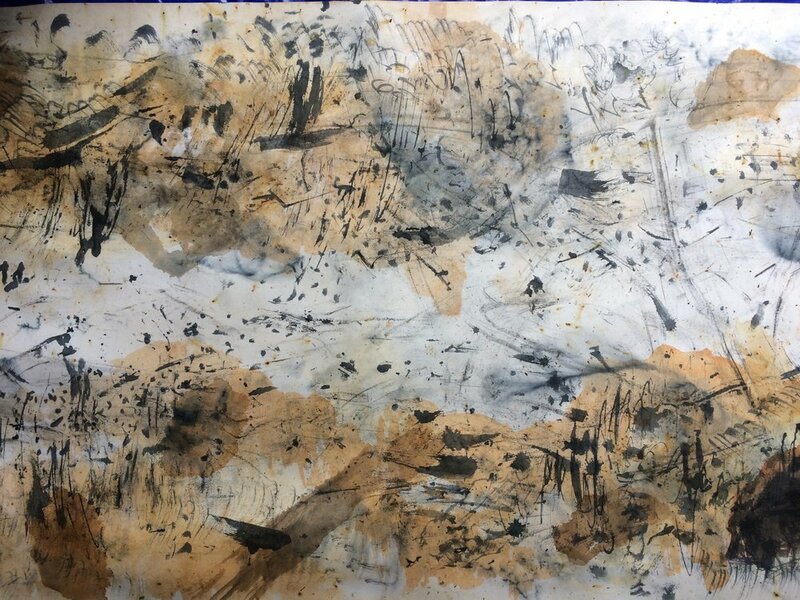 The calligraphic responses have already demarcated the space and to juxtapose another composition randomly on it is insensitive. Sometimes by chance or happy accident, the composition may come together. 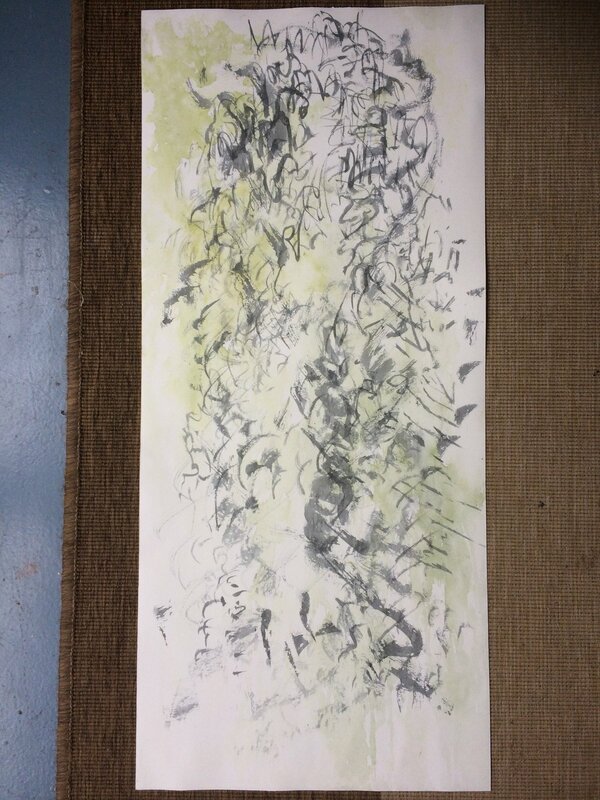 The next step in this process, is to paint calligraphic ink responses while doing the frottage. However, this would remove the bodily aspect altogether. I am also struggling with two separate considerations here. 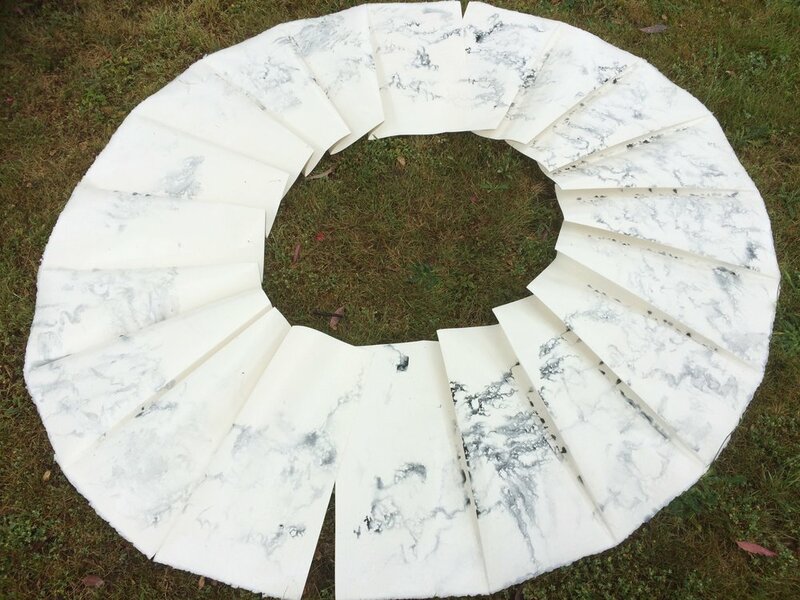 Drawings as research and drawings for commercial sale. I shall do a separate series of watercolour frottage pieces with calligraphic responses, possibly worked with my signature fine lines, for commercial sale. Upon further consideration, I have decided to give the shroud and frottage combination technique another try. 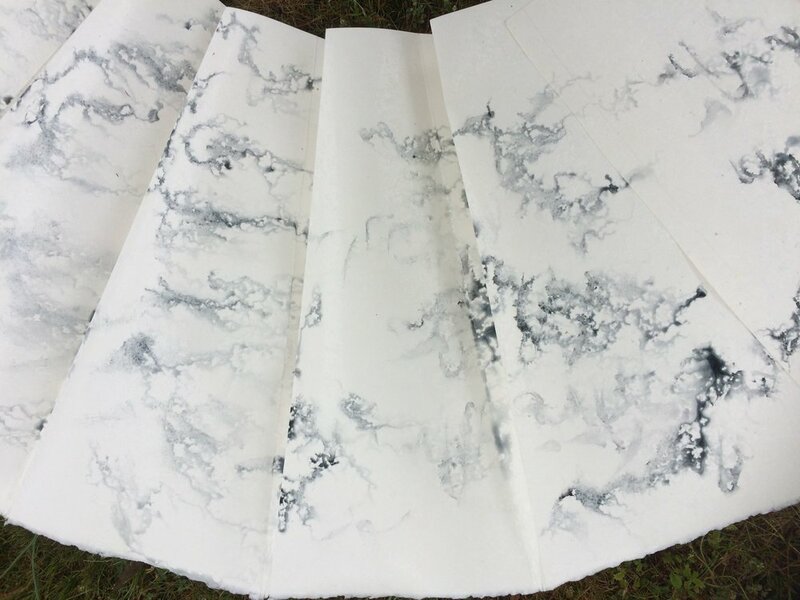 The shroud gestural method is actually very interesting and the brush marks are beautiful. They are a sensitive, immediate response to sound. As a piece of research, it is very interesting. Early in the morning at 5:45am, I was woken by small birds in a joyful post-storm morning frenzy. Went out to do a recording, but they had mostly left. I realised that the door in the bedroom to the back is not completely sealed and sound comes through very easily. 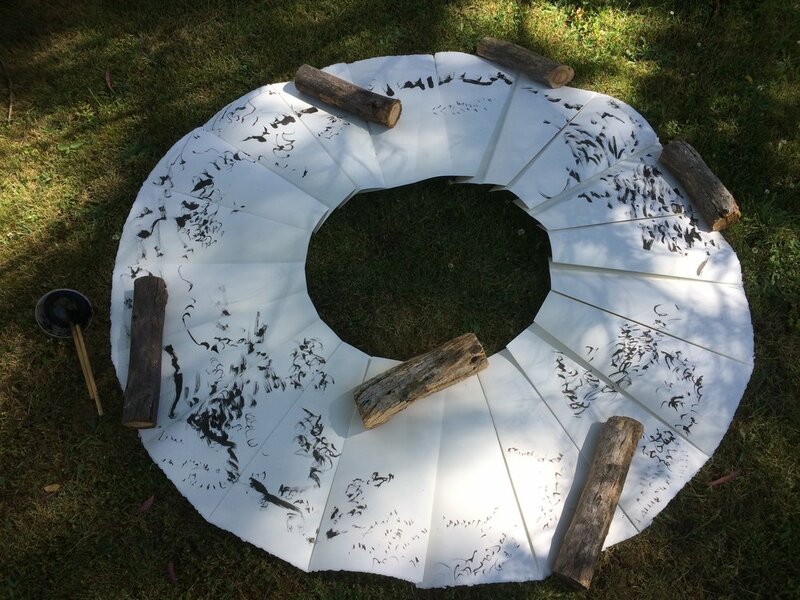 Took an hour walk in the afternoon and did two layers on the walking scroll. Beautiful evening with incredible range of blues in the clearing or gathering storm clouds in the sky. Worked on Golden Gully Ground scroll. Still not certain about it. There are some marks which are thoughtless and unpoetic. 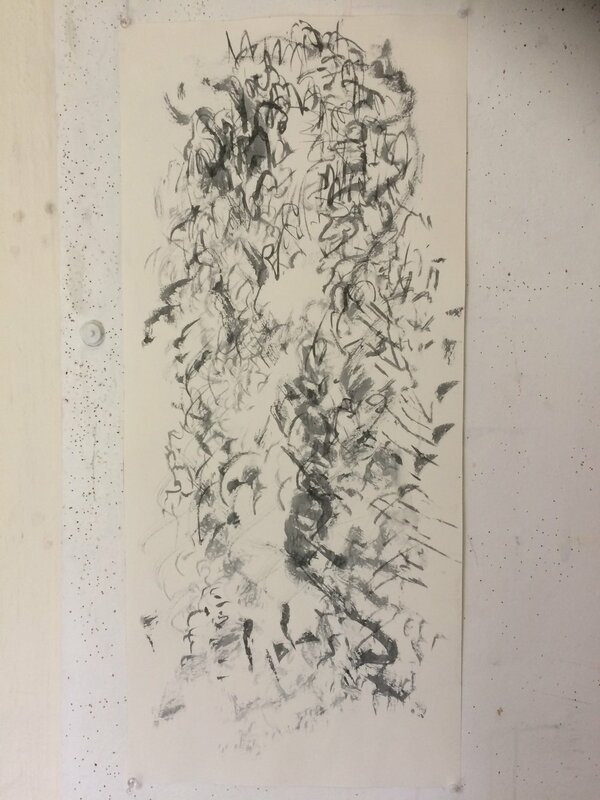 I put it on the floor, dipped fragments of willow charcoal in ink, then sprinkled them on the paper and attempted to respond to the sound using my feet. 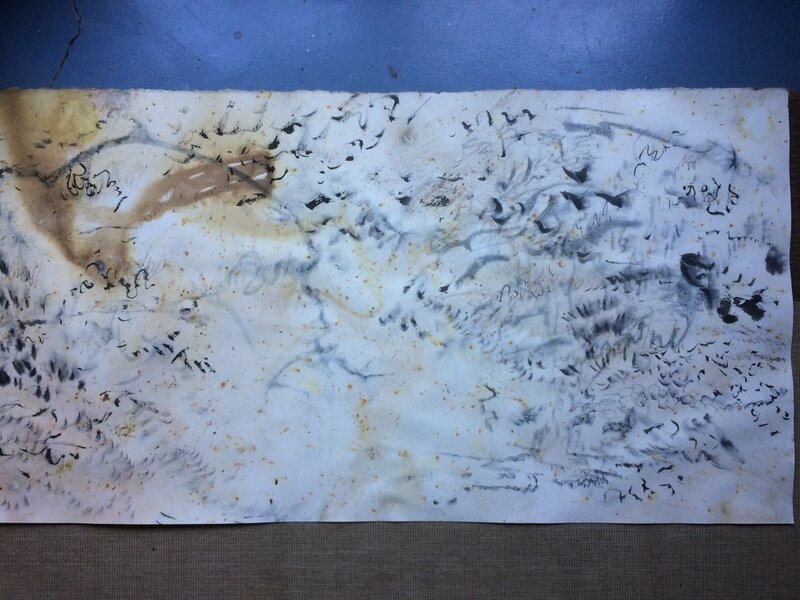 It was when I began using my hands to trace the insect sound that I fell into Jackson Pollock territory. I washed off the excess charcoal, then continued with brush and ink responses after lunch. These subsequent marks are far more meaningful. How well does this work truly convey my experience of aural and visual elements of the landscape? 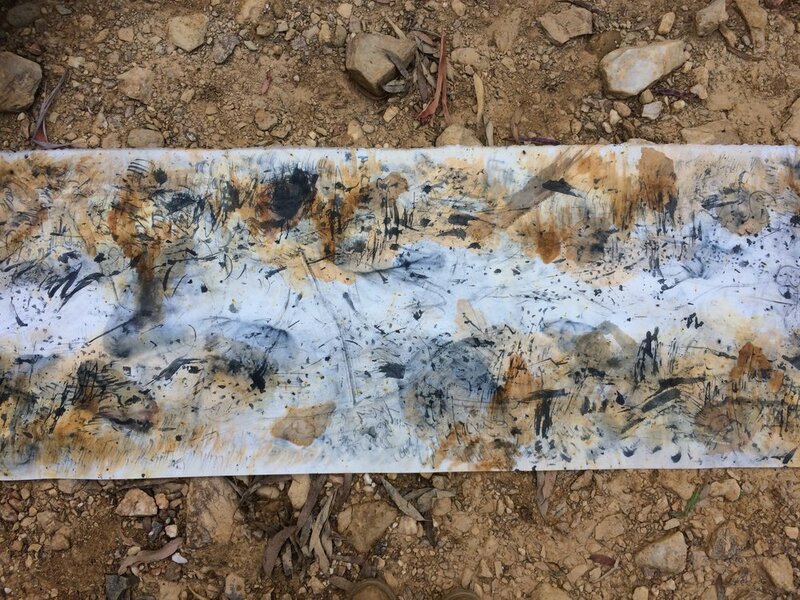 It is a very interesting work which conveys a bodily engagement with the landscape, responding to my footsteps, the sound of my own presence in the landscape. I think there needs to be more elements of visual response. The auditory and haptic responses are all there. Attempted a couple of recordings on the front verandah in the afternoon. Not terribly successful. No drawing today, just more pondering over the Ground Scroll. 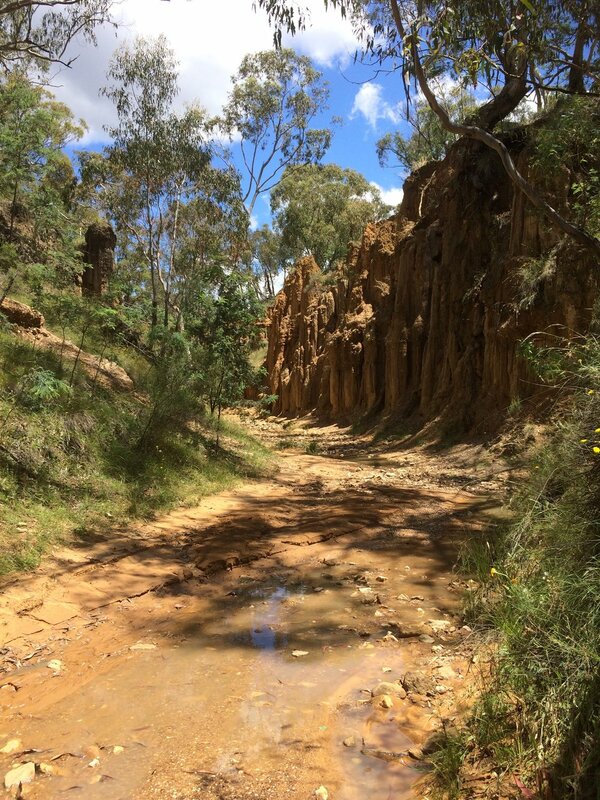 It captures the frenetic activity of the insects in the Gully, but not my footsteps, neither the wet squelch of the gravel in the shallow creek, nor the crunch on the angular edged quartz. What were my intensions regarding this piece? to record my presence? The sound recording already does this in an orchestrated way. I must think of this as its own work. What I want to capture in the drawing is the contrast of wet and dry steps, of the varied surface textures of the ground. My footprints remain in the mud for days. Has listening extended my drawing practice in this instance? 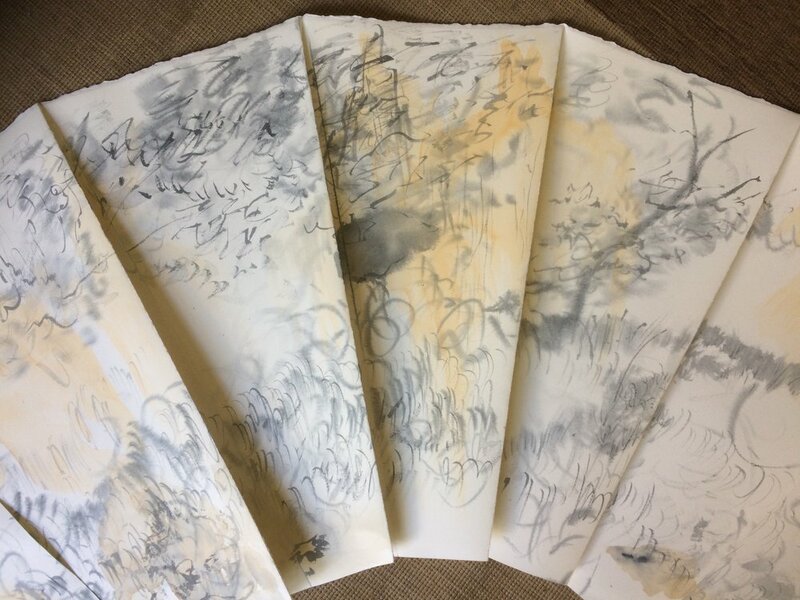 It has pushed me to explore possibilities of how to depict sounds, a visual foley. That is what I was attempting to do with the crunch of charcoal while walking on the work. I have been thinking about borrowing a handful of gravel from the Gully and dipping it in ink. Or pouring ink through it and walking on it, following the recording. Attempted a dusk recording at 8:45 this evening. The frogs in the small pond in the neighbouring field were very melodic, but too far for me to obtain a satisfactory recording. There are also many snails on the grass and back porch, and I was worried about crushing them underfoot. Got a few recordings this morning at dawn. There is a very short window just before full light when all the birds rejoice loudly at the new day. Sticking the microphones out the bedroom window were effective as it meant I didn't interfere or scare the birdlife with my presence. Nice proximity of small chirping birds close by and kookaburras, currawongs and magpies in the distance. Spent the morning touring Hill End with Mother, Brother and Taiyo. It was interesting to note that I am much more fond of this place now and only realise it when I am showing it to others with pride. The new Museum (only opened last month), the old Museum and History Hill Museum are wonderful examples of contemporary, old fashioned and eccentric museological practices. My favourite was History Hill, a private museum belonging to an obsessive collector who’s best investment was obviously his laminating machine. An eclectic, eccentric display of rare, museum-worthy pieces nestled amongst secondhand store treasures and unrelated educational displays salvaged from late twentieth century science museums. Each exhibit was accompanied by humorously idiosyncratic laminated commentary, full of spelling mistakes and wry, passive aggressive stabs at would-be thieves. The factual content of these plaques were dubious, but entertaining nonetheless. 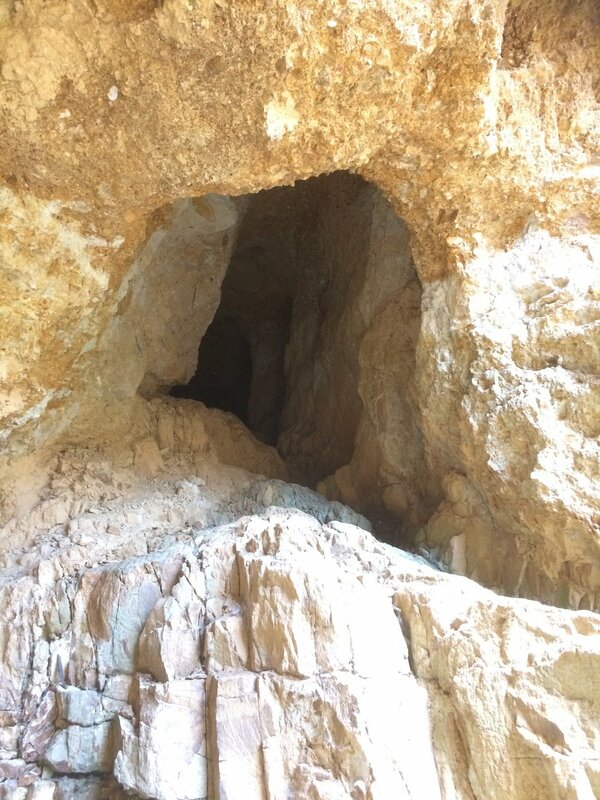 The best part was walking through a mine on the owner’s property, punctuated by macabre displays of a flesh eating rat and skeletons, as well as dioramas of Midas and the Goose/Golden Egg tales. To round it off we climbed up an 18 metre mine shaft which had very a questionable OHS standard. 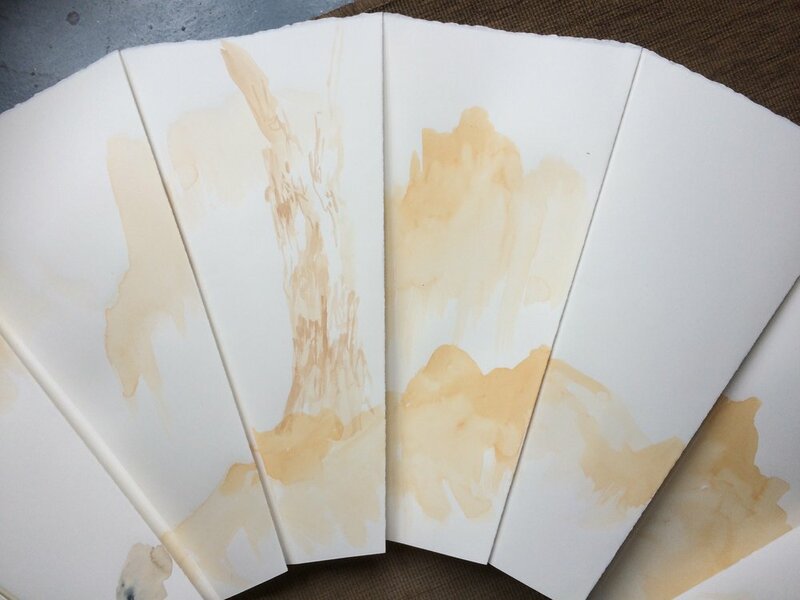 Morning session at Golden Gully adding Burnt Umber and Sienna Ink layers to the Binaural and Pleated Arc pieces. The Pleated Arc piece definitely needs another session with charcoal pencil for points of definition. I did a second session in studio this afternoon with the Pleated Arc piece, adding more brown ink. It is quite a busy piece already, but does not feel completed. 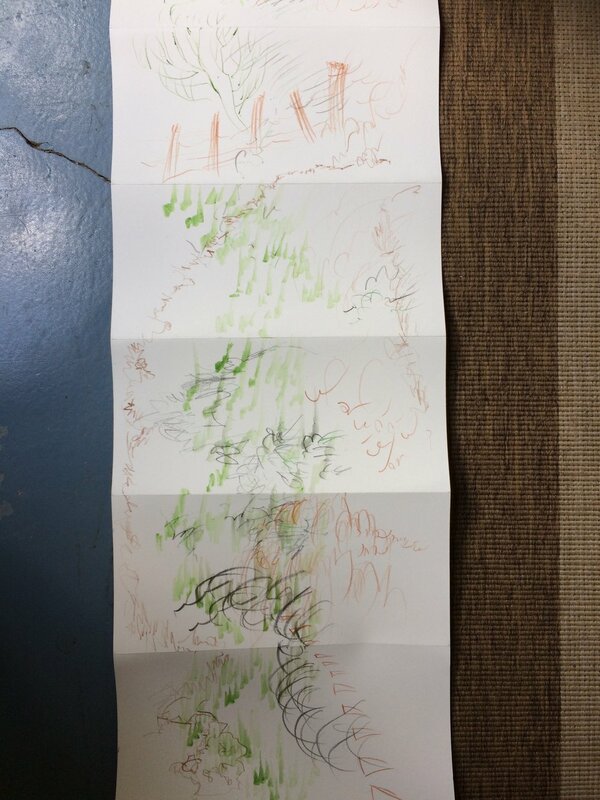 The Binaural drawing is definitely completed. After having now switched on my ears in the landscape, it is difficult to turn them off and focus on the visual aspects. 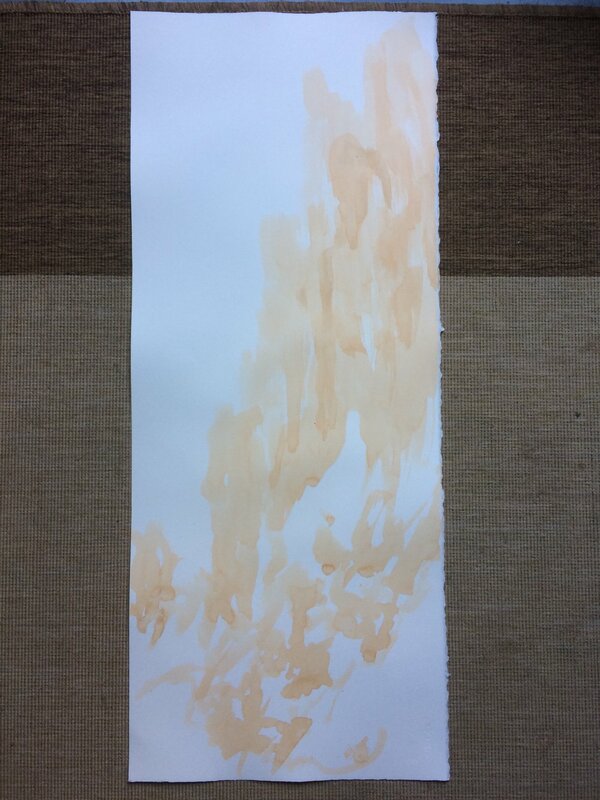 Evening session on the Golden Gully Ground scroll with burnt sienna and umber inks. Definitely finished and much easer in situ than from photos. A butterfly was guiding my brush and directing places that I should emphasise. The sun was beginning to set and from the bottom of the Gully, we saw a rare inverted rainbow cradling wispy clouds. I take it as a good omen for this work. Morning session with charcoal pencil on the Golden Gully Pleated Arc. I think the main issue I have with it is that it is very busy and the composition is concentrated in areas where I had the speakers in the studio. These works truly must be made in situ. However, it is finished. Afterwards, we went to Kissing Point Lookout and I completed the Binaural piece for this place. The weather was overcast and cool with a brisk breeze. Lovely compared to yesterday’s steamer. Back at the cottage, I did the colour layer for the Noon Tunic piece and added small amounts of colour to highlight sections of the Morning and Afternoon pieces (cheating slightly as they were not done on the actual times and were aesthetic decisions rather than purely perceptual). Completed these. 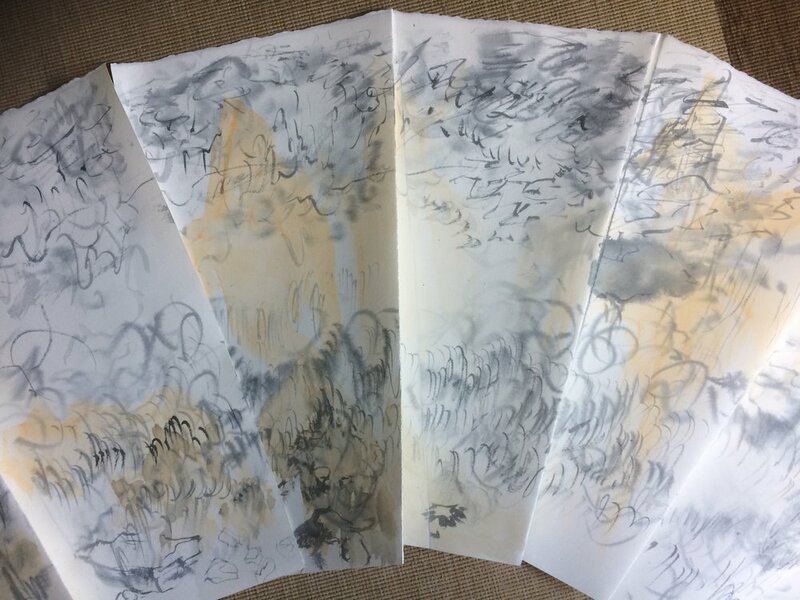 This evening after dinner, Taiyo and I took a walk around Hill End via Germantown Lane and I did a couple of layers (pencil and water brush) on the Hill End walking scroll. It was overcast, threatening rain, and the sky was a glorious medley of blues and greys, misty and gorgeous. The vastness of the sky here is so beautiful, the evenings so peaceful. Saturday 31 and Sunday 1. Left for New Years at Sydney on Saturday morning. Returned to Hill End on Sunday night 9:30pm. Very happy to have an extra week to do work. 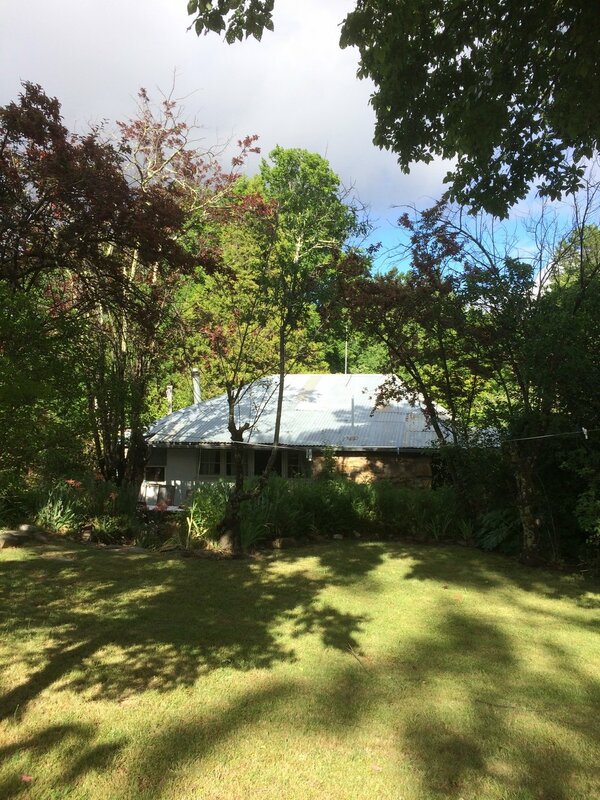 The sudden return to Sydney made me realise how much I enjoyed the quiet environment of Murray’s Cottage at Hill End, nestled in a grove of trees surrounded by birds. Sydney was unpleasantly hot and cramped. New high rise apartments appear each day. Peace, quiet and space are a privilege only the rich can afford. At Hill End with limited wifi and only three TV channels with minimum world news, I feel cushioned from the world’s problems. 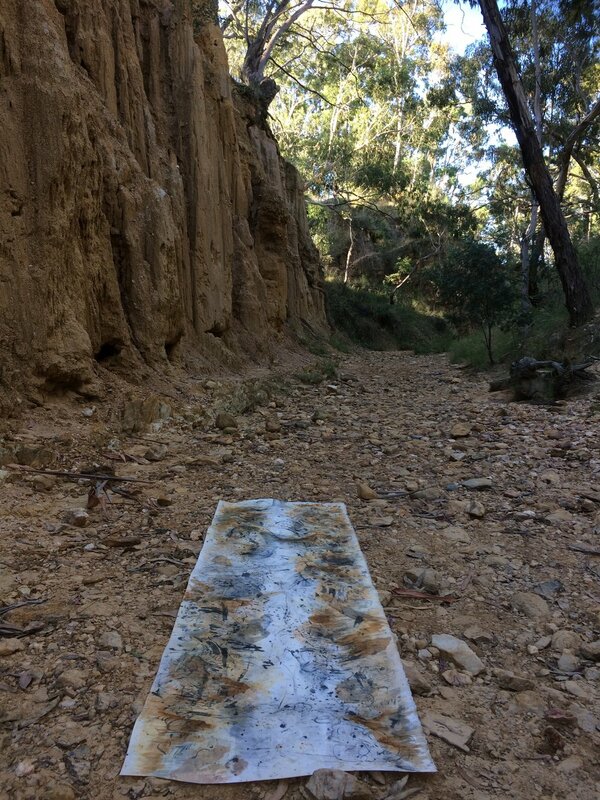 Stormed last night so the Golden Gully vertical diptych I left on the stone table was nicely soaked and weathered. 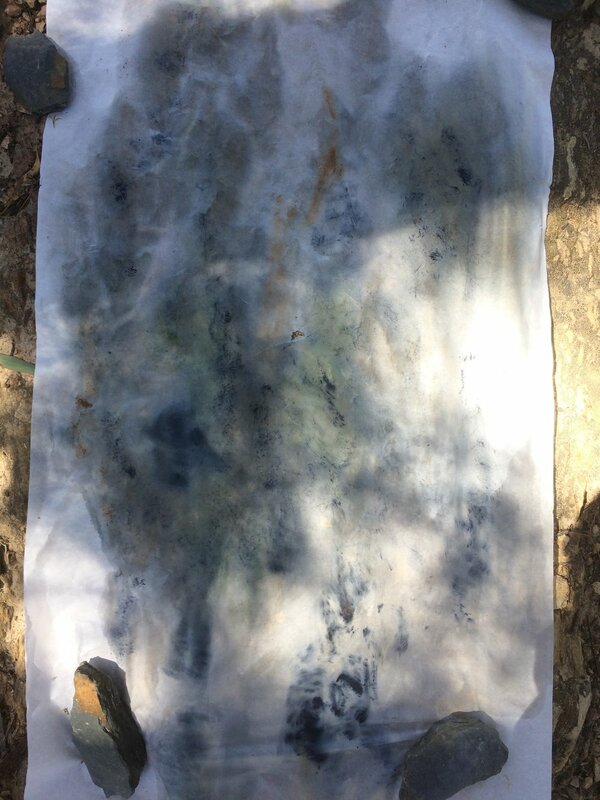 Woke late, and the sun was already hot and drying the paper, so I added some water onto the paper and puddles of blue back sumi. 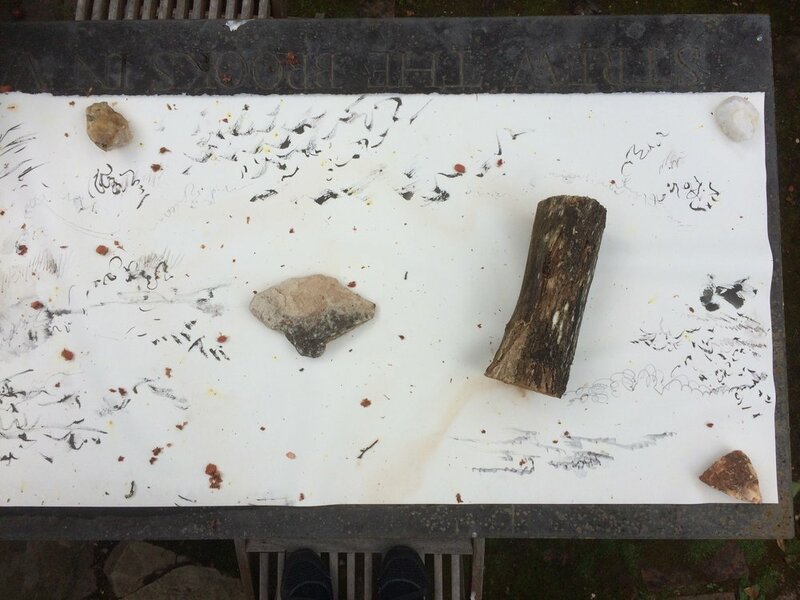 To prevent the sumi from running onto the stone table, I used rocks to lift the edges of the paper, making the water pool. More rocks on the paper attracted the ink to the edges of their shapes. 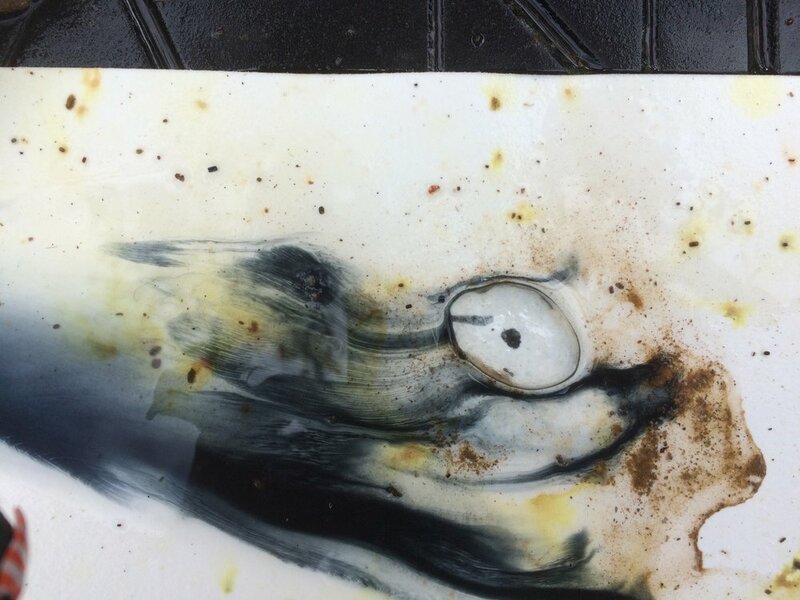 As the ink dried quickly, the patterns created by the suspended pigment on this work were more residual and completely different from pieces made when the humidity was higher. Also added some burnt sienna and umber ink. Started a vertical diptych of Split Rock for show in April. 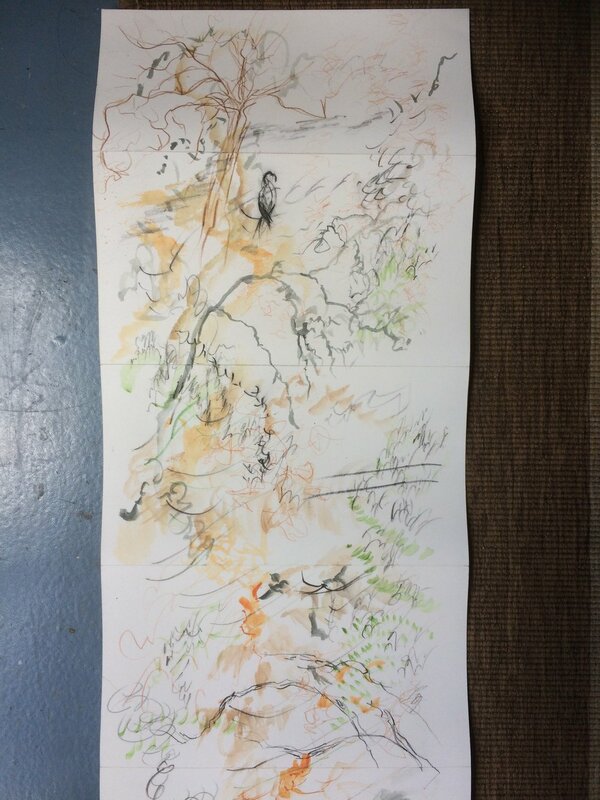 Began working on a horizontal diptych of Golden Gully. 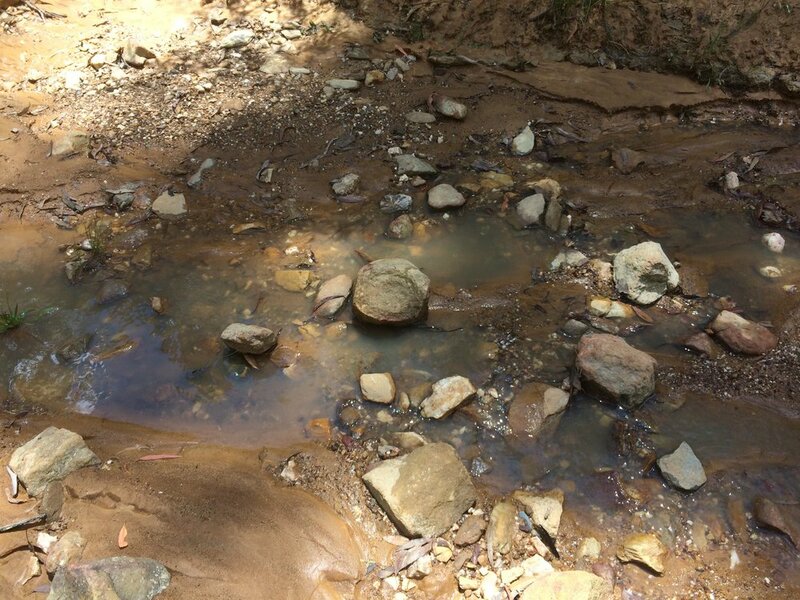 I had anticipated a small creek and mud when we arrived in the morning, however, most of the water from the rain on Sunday night had surprisingly dried up. Unsure what to do, as I had planned to smear mud on the work, I followed a vague impulse to walk the length of the gully and go back through a small tunnel that I had discovered a month ago. 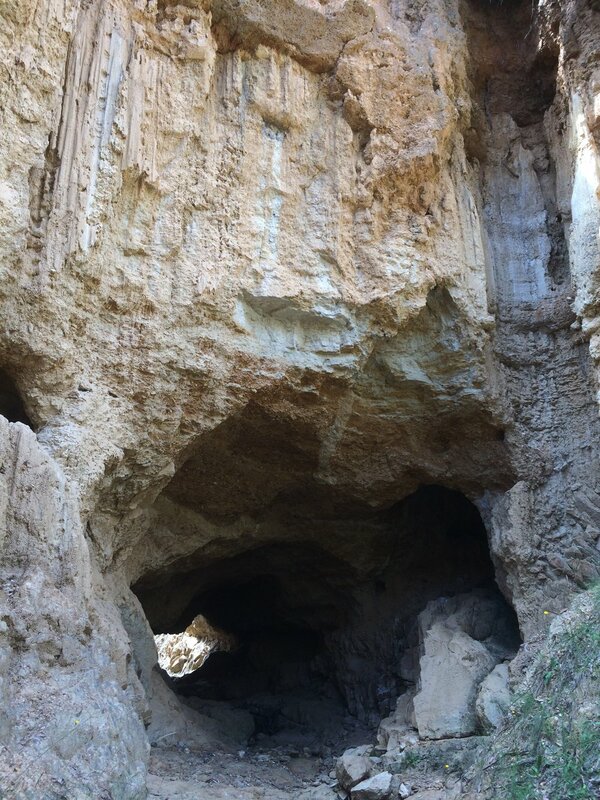 The tunnel still contained pools of stagnant water and beyond the tunnel was a black pool, tinted by the charred and rotting vegetation from higher ground. 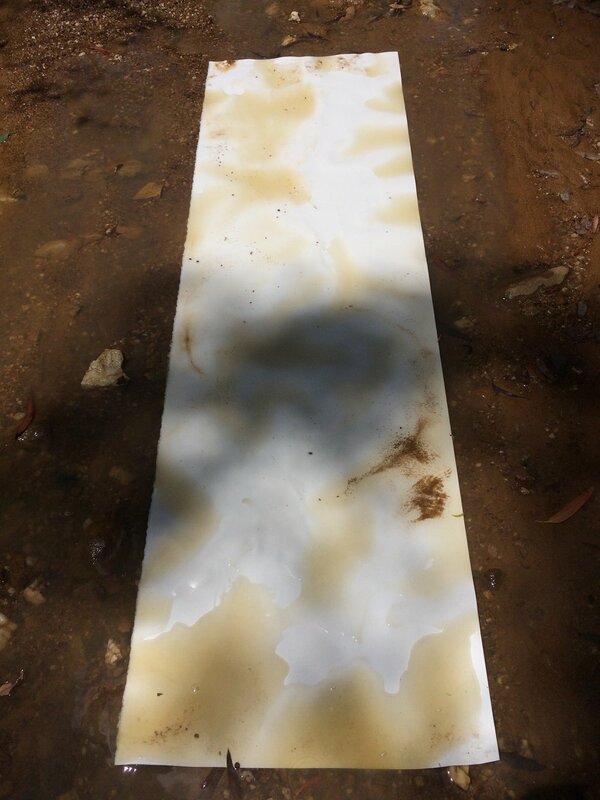 I placed the paper face down in this water and decided to drag the wet paper on the ground along the length of the gully. 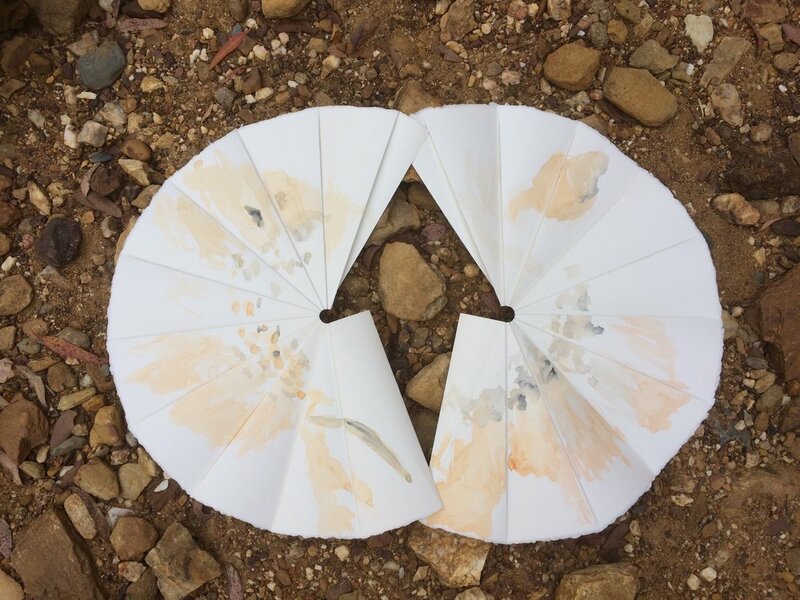 The darkness of the water did not stain the paper much, but the wetness allowed the yellow soil to colour the paper. 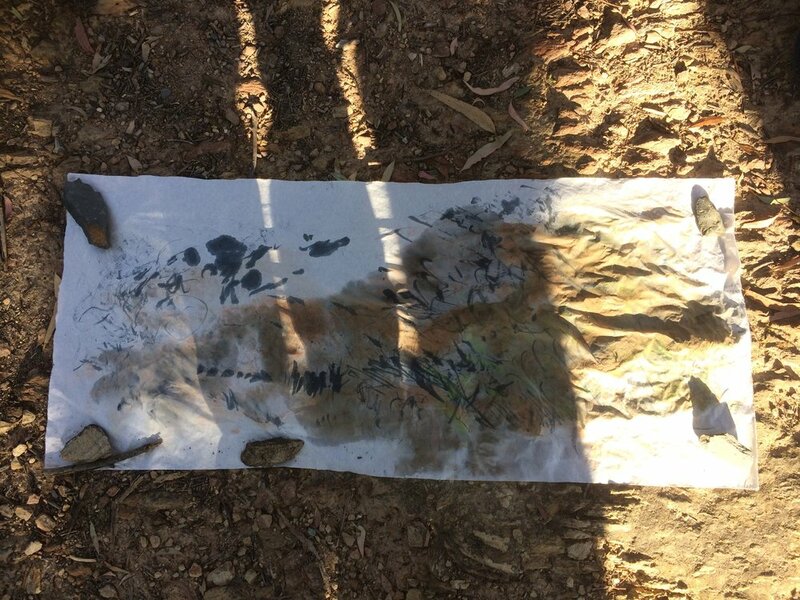 I then painted the Gully walls with ink and dragged it from one end of the gully to the other a second time. This was an interesting development. 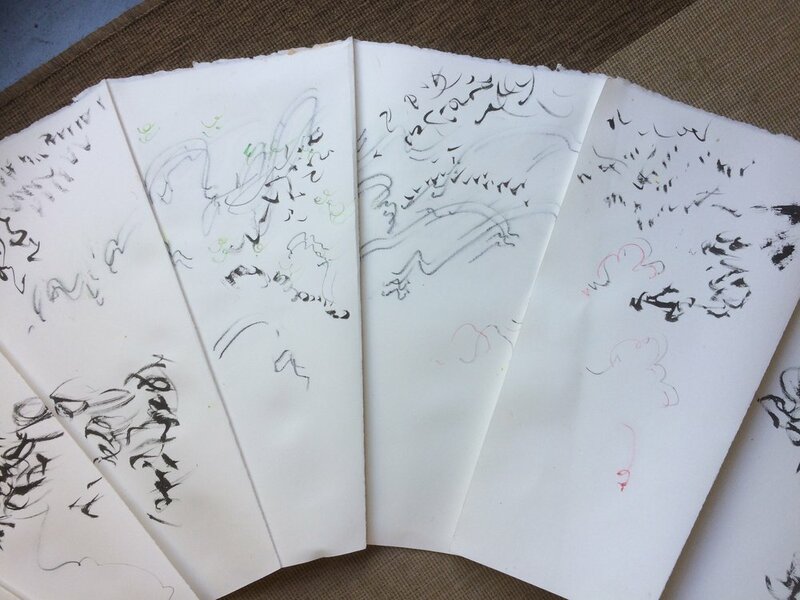 Rather than drawing the sound of my steps, I am recording the passage of movement by inscribing it on the paper. I might make a sound piece from a recording of this passage. Worked on Split Rock piece. Nothing was going right on it. The drawing I had made yesterday afternoon was too strong. 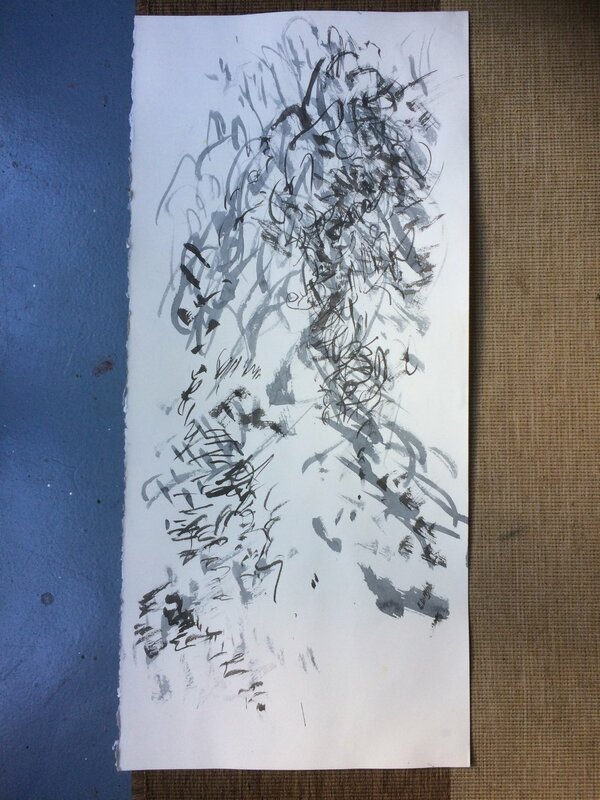 Did several layers of ink in response to sound recording. Just didn't work. However, I did like the precipitation of the ink and watercolour mixture. Woke to a beautiful day of uncertain weather, blowing cloudy one moment, then sunny the next. A perfect day for drawing outside. Made a couple of recordings as soon as I woke up at 7am. 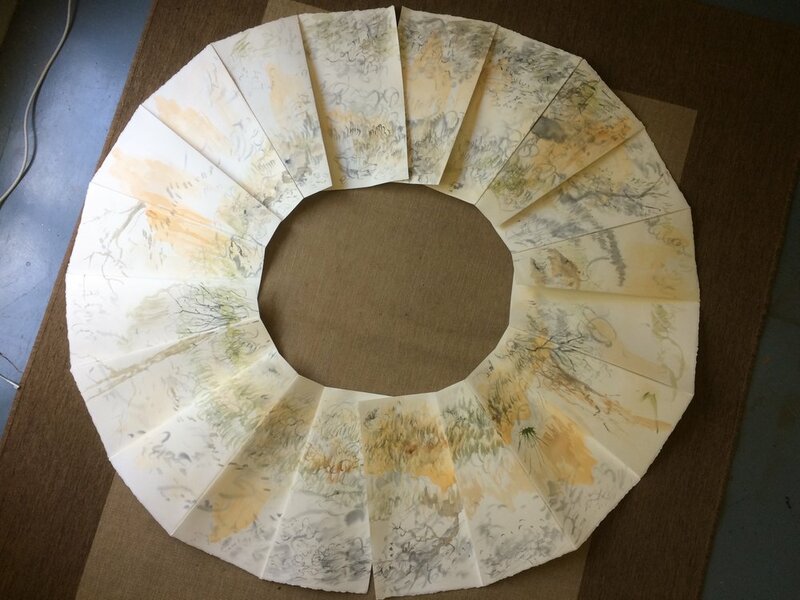 Quickly cut some paper and went under the eucalyptus to draw the sound of leaves in the wind. I have loved this tree since my first day here. The gentle rustle of a multitude of leaves is so soothing. Also added some watercolour layers to Golden Gully Diptychs in the morning. 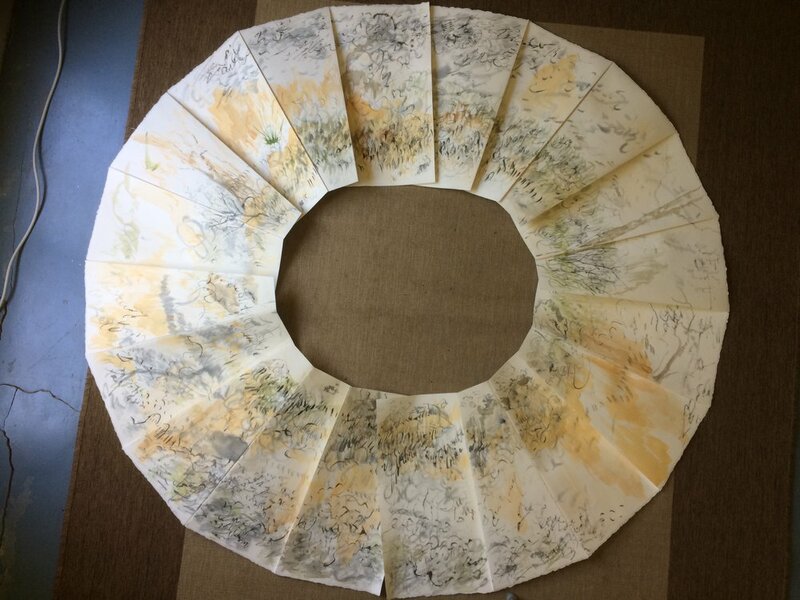 At noon, I added green/grey and pale orange to the drawing of eucalyptus leaf rustle. Very happy with with piece so far. I realise that I must leave room for my mind to refresh and the drawings to develop on their own. If I continue for too long and my mind is tired, the lapse in concentration shows in clumsy overworked strokes. I also realise that it is important for me to focus on one type of sound and concentrate. 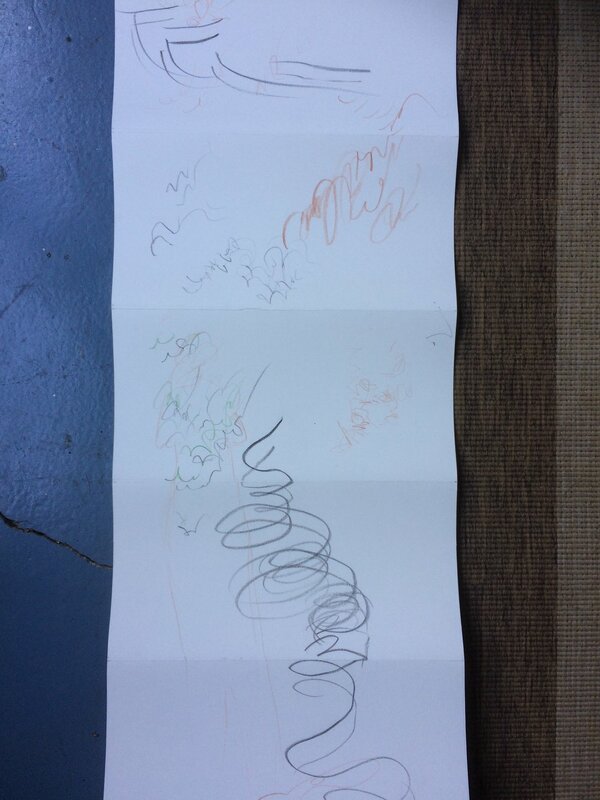 Otherwise the drawing becomes confused and scattered like my attention. I love the sound of trees in the wind, because it corresponds directly to the physical, visible movement of the leaves. Bird calls are invisible to the eye. 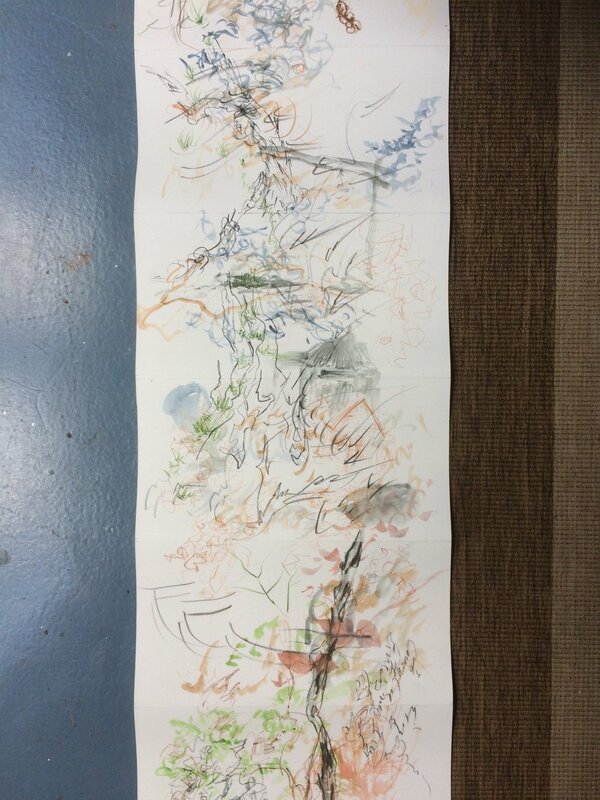 This afternoon, we took a walk down Germantown lane again before dinner and I did another layer on the Hill End Walking scroll. It is a nice record of this routine we have established. I think it is almost finished. Morning session to finish off the Eucalyptus leaf drawing. Had a Kandinsky moment when all looked good then I realised that the right panel was upside down. The piece is a meditative one, different again from any of the others I have made this past month. Concentrating on just one sound is helpful. What I have discovered in this tension between making commercially attractive works and experimental research drawings, is the importance of visual affect when the work moves into a purely abstract realm. I think I will need to discuss this in my paper, especially as I begin to develop work from information gathered from these experimental drawings. 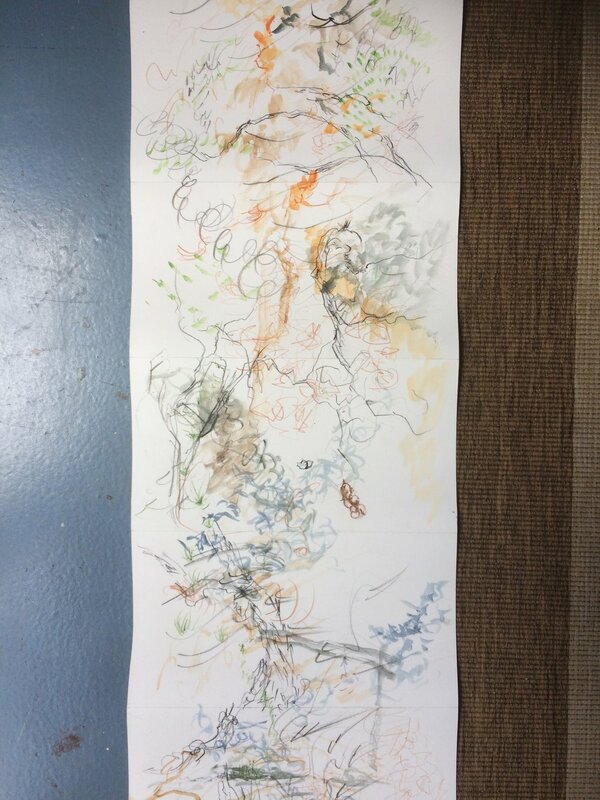 The decisions I make in the journey towards creating an attractive artwork differ from those I make while exploring perceptual and cognitive functions during drawing. Both these types of decision making are revealing of the process of making art. Also worked on the two Golden Gully Diptychs. 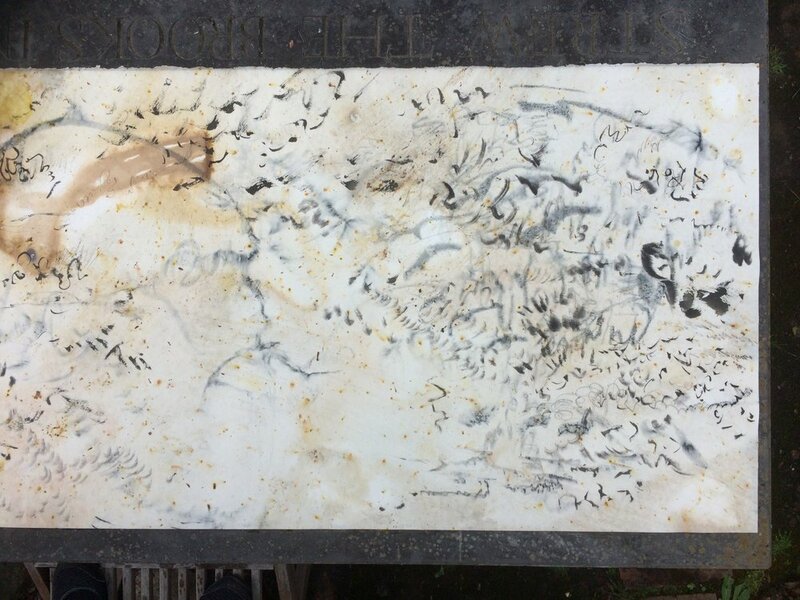 The vertical piece was layered with repetitive marks in ink focusing on insect sounds and the horizontal piece was worked with crushed charcoal dipped in ink and spread with fingers. I overworked the vertical piece in the afternoon and had to wash some of the ink off. Thankfully I may have salvaged it, but am forbidding myself from touching it again until tomorrow morning. Did not manage to salvage the vertical diptych. 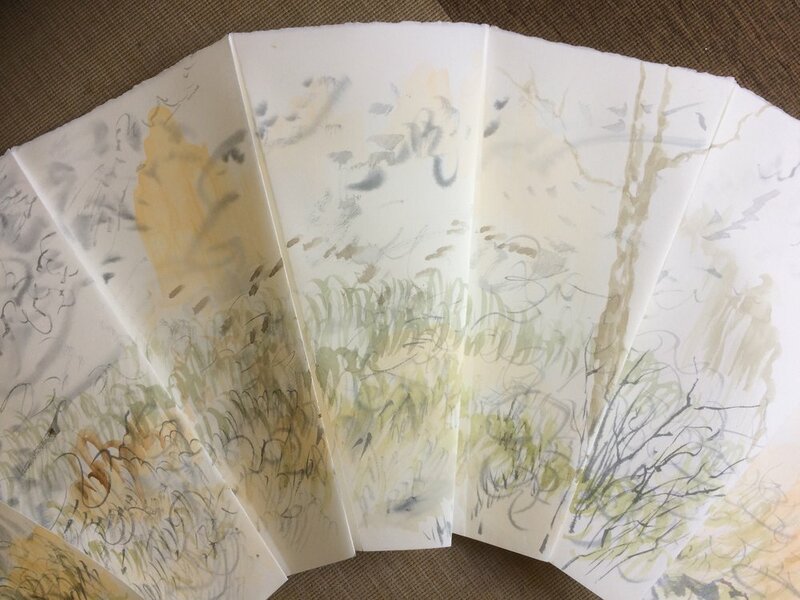 Started afresh on the back of the paper using a meditative repetitive mark making method similar to the eucalyptus piece. Overabundance of plums meant we spent the early evening harvesting and sorting several large bags full. Made recordings in Germantown Lane. Not very good as there were trucks and cars, as well as a handheld leaf blower. Continued on Golden Gully Vertical piece. Added some fine vertical marks to capture the texture of the rock face in the Gully and also a nod to my previous style. Needs more vibrancy. The whole thing at the moment is muted and brown. Made long recordings at 5:30am of dawn. Lots of birds, few human sounds. Magpies, small birds, black cockatoos, currawongs, kookaburras. Did the final layer of drawing on the Hill End Walking Scroll. 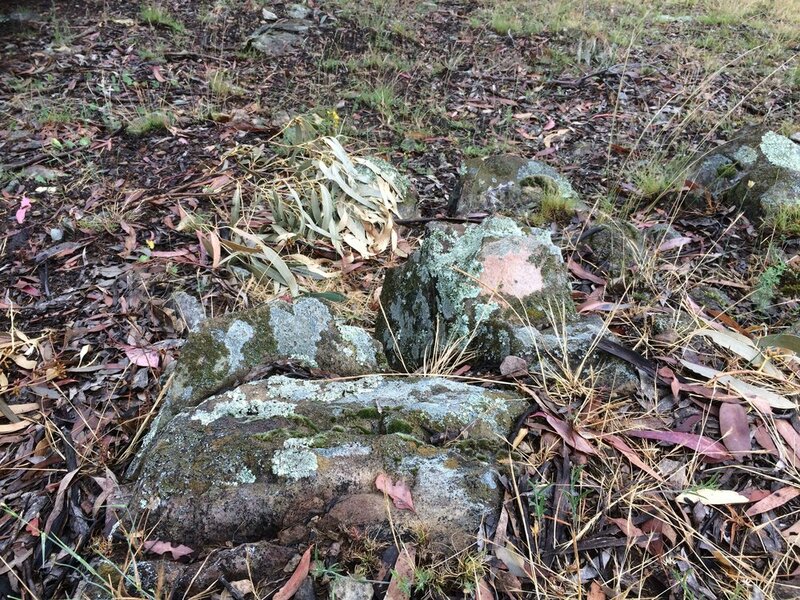 Returned rocks and items to Tambarroora, Golden Gully and Kissing Point Lookout. 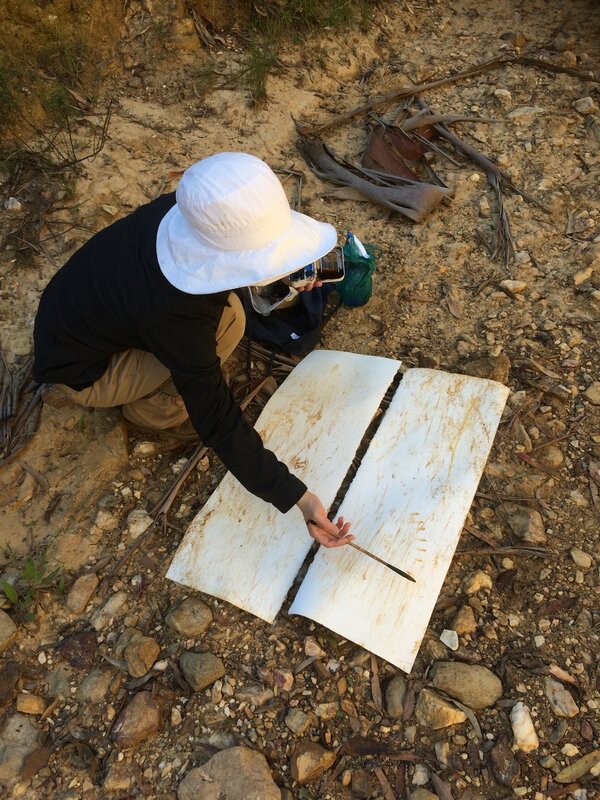 Dragged one last square of paper in the ochre water of Golden Gully. Prepared for our return to Sydney tomorrow. When both visual and aural sense modalities are made available, vision is prioritised. However, the visual image belies the true nature of the experience and cannot capture the full vibrancy of a place. Sound holds clues to the physical experience of place beyond what can be documented by a visual image. The sonic potential of materials, the sonic affordances (to borrow from JJ Gibson), can only be revealed through an activation of that material, whether by human agency or atmospheric conditions.